Last week’s article about Alejandro Bulgheroni’s Uruguay winery, Bodega Garzon leads to his week’s news: Bulgheroni expanded his reach into Napa Valley. Bulgheroni purchased the Founders Room winery from Bill Harlan, the owner of the acclaimed Harlan Estate wine and the Napa Valley luxury resort, Meadowood. Renamed Alejandro Bulgheroni Estate, the new venture will be led by two internationally renowned wine experts with Bordeaux roots. Winemaker Philippe Melka– born and educated in Bordeaux–worked at Chateau Haut-Brion and Petrus before moving to California. 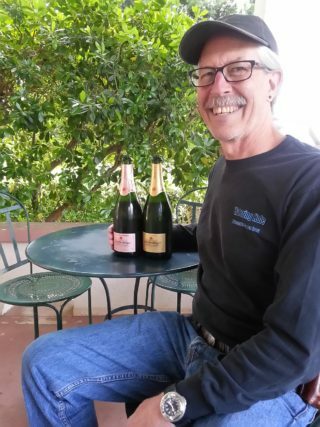 In Napa, he added Dominus, Quintessa, Hundred Acres, Bryant Family and other top-flight wineries to his resume. The new Bulgheroni vineyard is certified organic and the first vintage (2014) will be released in 2017. Save your pennies. In the parlance of the wine world, where landscapes are often defined in fashion-model terms—stunning, gorgeous, even jaw-dropping —no one would describe the drive from San Francisco’s airport to Boonville in Anderson Valley as a “good-looker.” For nearly two and half hours drivers navigate the tedious, car-choked Route 101, the primary artery of California’s wine heart. They pass exits for Napa Valley’s Architectural Digest-styled wineries, and the understated, but consciously chic Healdsburg. But 20 more minutes farther north, the exit for Route 128 changes your perception, and life is beautiful. Driving from Beaune, Burgundy’s unarguable wine heart, you travel north through the Cote de Nuits wine villages where pinot noir reigns: Aloxe-Corton, Nuits-Saint-Georges, Chambolle-Musigny, Gevrey-Chambertin and others. Or, you head south through the Cote de Beaune towns with vineyards of pinot noir and chardonnay: Pommard, Volnay, Meursault and the hyphenated Montrachets of Puligny, Chassagne, Batard, Bienvienue-Bartard, Chevalier and the madonna of all chardonnay wines, Montrachet. Anderson Valley is much smaller, but as I discovered, no less impressive. There are the pinot noirs of Boonville and next door Philo (population 349), and chardonnays, too. And just as Burgundy makes first-rate Cremant de Bourgogne sparkling wine using the traditional method of second fermentation in the bottle, Anderson Valley has its excellent sparkling wines employing the same techniques. 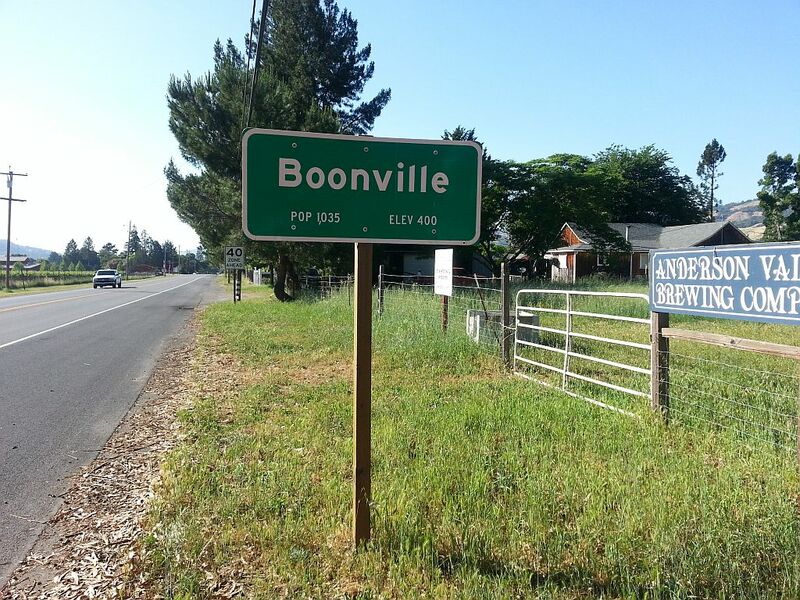 Unlike the city of Beaune, Boonville’s downtown is two blocks long and one story high, and more countrified, too. 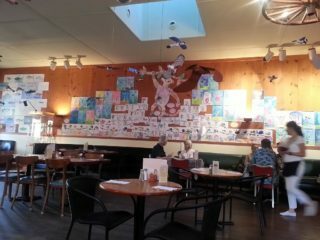 There’s Lauren’s restaurant where schoolchildren’s drawings substitute for wallpaper, and toys hanging from the ceiling are the décor. And the chicken pot pie is as authentic as any coq au vin I’ve eaten in Burgundy. On both sides of Boonville’s center are wineries as unassuming as those in Volnay and Chambolle-Musigny. Being American, the Anderson Valley owners are more approachable, their tasting room doors open wider. Winemaking in Anderson Valley dates from California’s Gold Rush era when Italian immigrants arrived, then Prohibition ended it, until 1964 when Pasadena cardiologist Donald Edmeades opened Edmeades Folly winery, making him the first modern-day grower to plant in what was then a remote stretch of western Mendocino County. Today there are 30 bonded wineries here ranging from ridge to valley, with a diversity of lifestyle philosophies influencing Anderson Valley wines. 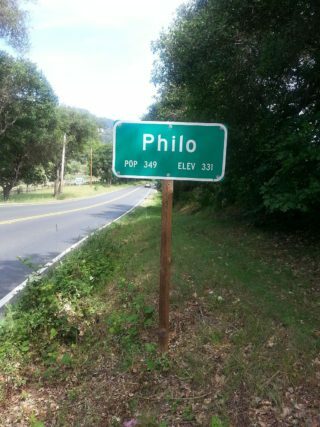 Sitting five miles up a dirt and rocky road is Philo Ridge Vineyards, an operation completely off the grid. Built by Fred Buonanno and his winemaker wife, Heather McKelvey, from redwood trees cut and milled on the property, all the energy for their home and winery is supplied from solar panels and a wind generator. On the other end of the spectrum–on Booneville’s valley floor–the polished Goldeneye winery, whose wines bear the modernist stamp of owner Dan Duckhorn of Napa Valley’s highly-regarded Duckhorn Vineyards. While tasting more than 100 pinots noirs at the Anderson Valley Pinot Noir Festival in May, I found myself comparing them to Chambolle-Musigny, Nuits-Saint-Georges, Volnay, Beaune and Chorey-Les-Beaune wines– something I never thought appropriate for pinot noirs from any other California appellation. 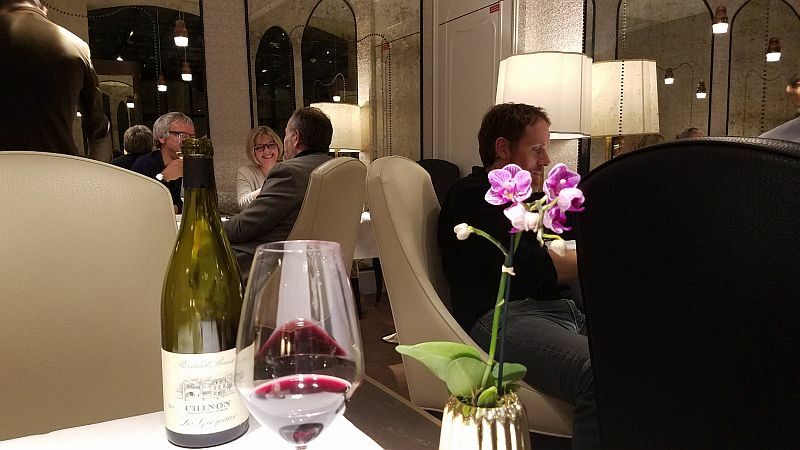 Some Anderson Valley pinots contained the delicate texture, and Chinese five-spice aroma and flavors mingled with raspberry accents that enchants me the way Chambolle-Musigny does. Others had Nuits-Saint-Georges’ black-cherry and pomegranate fruit flavors girded with minerality. Volnay’s character of integrated tannins and black-cherry aroma and flavor with a velvety, round texture and endless pleasure emerged in certain Anderson Valley pinots. Then, there were the cranberry, strawberry or cherry compositions with bright acidity that recalled Savigny-les-Beaune and Beaune 1er Crus. 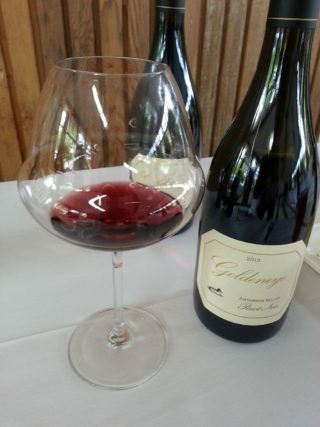 And the character of next-door-neighbor Chorey-Les-Beaune appeared in Anderson Valley’s juicy red fruit flavors structured with soft tannins and acidity. The hillside vineyard wines were laced with minerality and a stony accent. But rarely found were the high alcohol, overoaked, extra-ripe pinot noirs constructed in other parts of the Golden State. 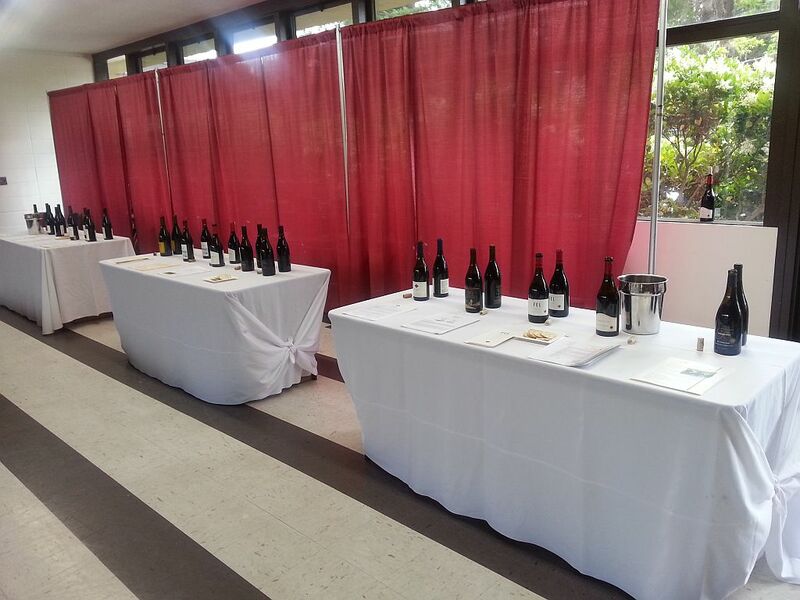 From the two-day tasting, here is a selection of each pinot noir style with a base rating of 90 points. 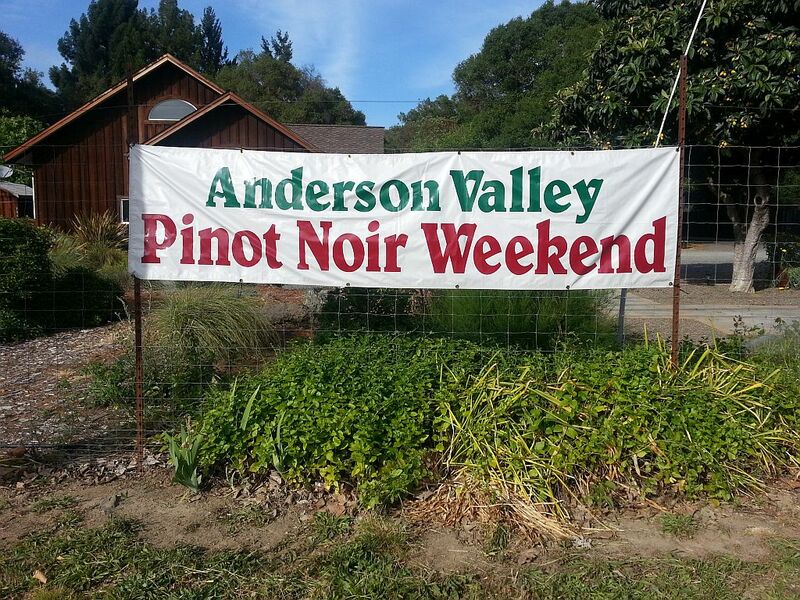 All carry the Anderson Valley appellation. Small production is the rule–sometimes fewer than a 100 cases–but if you make the effort to find some of these gems, you will be rewarded. For some wines, you’ll have to contact the winery. 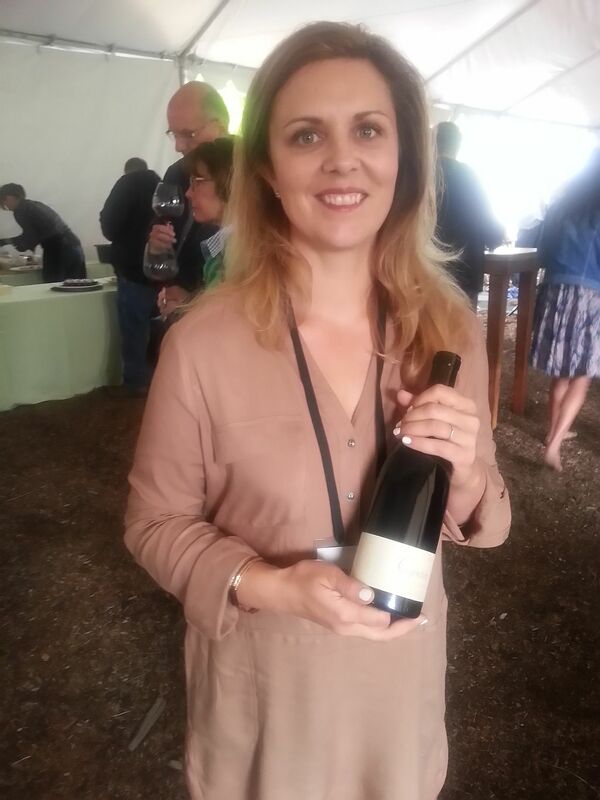 Susan Wuetarich, Copain’s newly appointed Assistant Winemaker. 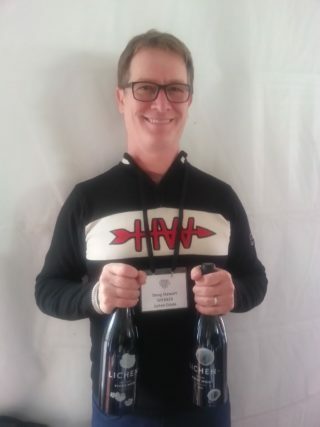 2013 Lichen is winemaker and owner Doug Stewart’s new estate wine. While Toulouse winery is in Anderson Valley, Weir Vineyards is in Mendocino’s Yorkville Highlands appellation, seven miles south of Anderson Valley. The wine has a pleasing raspberry personality with an elegant texture and finish. 90 points $55. 2009 Knez winery, Cerise Vineyard. Extending from 700 to 1,100 feet the Cerise vineyard was planted in 1995. The 2009 was the oldest wine in the tasting and still fresh; a mix of black-cherry, leather and blackberry aromas and flavors, elegant texture and depth on the palate made this one of my favorite wines. 95 points. $36. 325 cases. 2014 Cakebread Cellars, Two Creeks blends fruit from Apple Barn and Annahala vineyards, yielding black cherry and blackberry aromas and flavors underlined with a smoky, toasted oak accent. 90 points. $42. 2013 Husch winery, Reserve, Ferrington Vineyard is a special bottling of two parcels of pinot noir from the acclaimed Ferrington Vineyard. It has an appealing mix of strawberry and cherry flavors, integrated tannins and minerality. Husch is celebrating its 40th anniversary, making it Anderson Valley’s oldest winery. 90 points. $38. 130 cases. 2013 Copain, Wendling vineyard is the second vintage produced from this vineyard that Copain planted in 2008 at the “deep end” of Anderson Valley. The 2013 displays fresh raspberry and cherry aromas and flavors with a crisp, red fruit finish 92 points. $60. In May, Copain was purchased by the international wine conglomerate, Jackson Family Wines. Let’s hope this tiny gem’s unique wines are not bastarized by the bean counters; the history of boutique wineries being bought by mega-corporations is one of sacrificing quality on the altar of quantity. 2013 Williams Selyem, Burt Williams’ Morning Dew Ranch Vineyard delivers new oak cinnamon, raspberry and cherry pinot noir structured around integrated tannins, minerality and noticeable acidity in the cola finish. 92 points. 2013 Foursight Zero New Oak brings a Chorey-les-Beaune-styled wine packed with fresh cherry, raspberry and mild white pepper that belies its light body. Only second and third year barrels are used. 91 points $38. 163 cases. 2014 Nelson Hills, Deep End Vineyard, Mendocino If this wine was a song, it would be titled, “All about Cherry.” That’s the color, aroma and primary taste with mellow tannins. 90 points. $42. 279 cases. 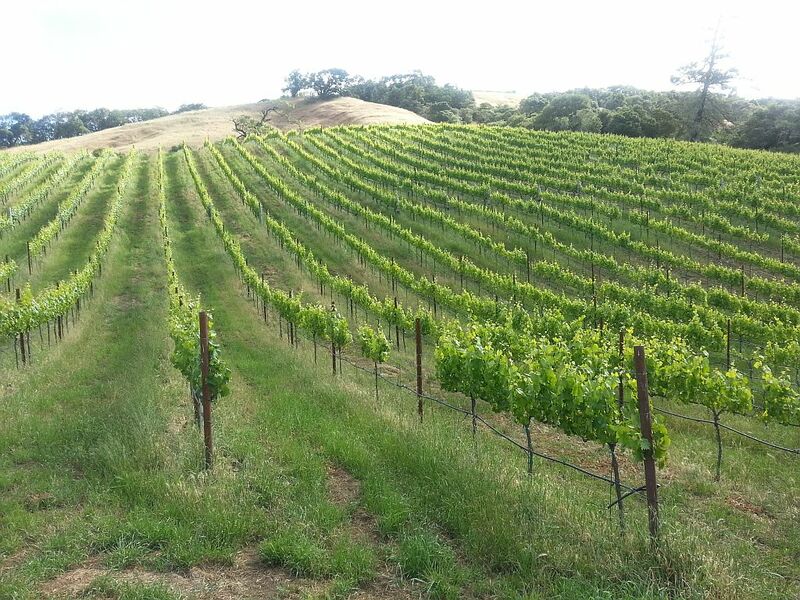 2014 Maryetta, Valenti Vineyard, Mendocino Ridge. The color of rose petals, and mellow raspberry and cherry fruit; balanced and pleasant drinking. 90 points. $38. 48 cases. The 2013 Elke Vineyards, Donnelley Creek Vineyard recalled one of my favorite Burgundies: Chassagne-Montrachet rouge. Its combination of strawberry, cherry and white pepper aromas, and delicate body bearing tasty strawberry, cranberry and cherry flavors with minerality and mild acidity was delightful. 90 points. $36. 150 cases. Elke’s 2012 Donnelley Creek Vineyard told the same storyline but with a little more black cherry and spice-box accents. 93 points. And owner, Mary Elke poured her decanted, brick-orange-colored 1998—a tough vintage of cold spring and hot spikes during harvest–whose leathery, dried-raspberry aroma and flavors recalled decades-aged Muga and Vina Tondonia Rioja wines. 90 points. 2013 Brutocao Cellars, Slow Lope’n Vineyard limited the new oak to 40 percent in this tasty raspberry, strawberry and cedar-scented and- flavored wine. 90 points. $24. 1,875 cases. 2013 Williams Selyem, Ferrington Vineyard. In 1992, Williams Selyem produced the first Ferrington Vineyard-designated pinot noir, drawing attention to what became one of California’s most important pinot noir sources. This vintage is cherry-driven with a background of stony, red fruit taste. 90 points. 2014 Twomey Cellars is the Anderson Valley arm of Napa Valley’s renowned Silver Oak winery. Here, a cranberry-cherry pinot noir is sent that is balanced and immediately drinkable. 90 points. $50. all photos by John Foy. It’s easy to get swept away in Paris–after all, it is the city for and of lovers. But it’s not always so easy to find places for dining off the beaten track that deliver both delicious food and memories. 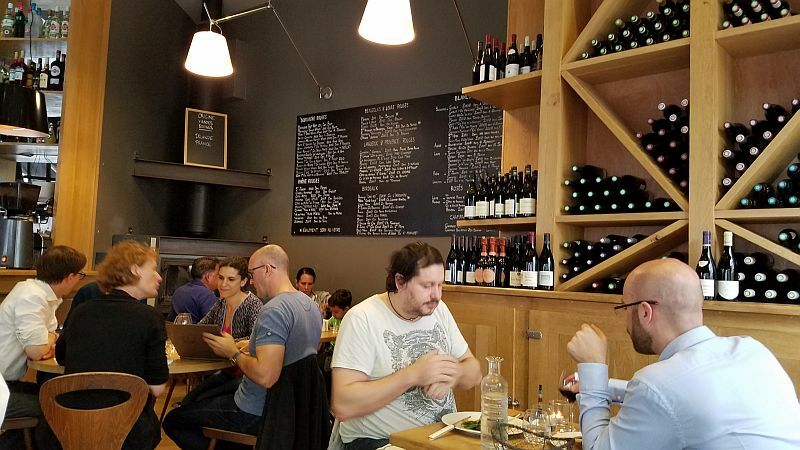 If you want quality neighborhood restaurants, wine-oriented restaurants with fair prices, chefs putting their talent on every plate and dining room staffs serving you with care, spend some time with this list and in these restaurants. I spent 25 years in the kitchen and 23 years as the owner of three restaurants. And for four decades I’ve been visiting wine cellars, vineyards, and interviewing winemakers. I recognize that we all have our preferences in food, wine, ambiance and prices; but I’m confident there are many restaurants on this list, culled from my personal experiences, that will please you. I eat here every time I’m in Paris. It’s a must-go place for lunch, with continuous service until 8pm. The restaurant is on the second floor of this high-end wine shop. Filled with French business folks enjoying excellent food and wines by the glass and bottle. Bonus: you can take any bottle from the wine shop bring it upstairs to your table and pay the wine shop price; no corkage nor service charge. Or, choose from the large wine list. I’ve been coming here for so many years, I can’t recall the first visit. But at my May 2015 lunch I had the pleasant discovery of Lavinia’s use of the Coravin, which allowed me to enjoy glasses of Clos St. Denis, Charmes-Chambertin and Vosne Romanee. My return visit for lunch in October 2016 introduced me to a pleasant, new wine: Domaine de Bellieviere, Jasnieres appellation. Located 30 miles north of Tours (Loire Valley), this biodynamic winery is owned by Eric and Christine Nicolas. 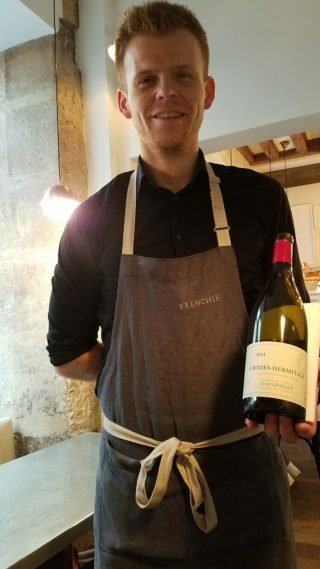 Its 2014 Clos des Truffieres is very perfumed, light as a feather and weighted with raspberry and black-cherry flavor that was excellent with my steak tartare.–Discovering wines like this is why you go to Lavinia. Along with those gems was a glass of the Chinese five spice-perfumed- and black-cherry-flavored 2008 Domaine Henri Boillot Volnay, which rode in tandem with a plate of charcuterie. But all was not red at our luncheon: the elegant vanilla- and apple-scented, 2015 Macon Village, Julian Guillot, Les Pierres Blanches was filled with delicious white fruit flavors. Juveniles. (1st arr.) 47 Rue de Richelieu. The flip side of Lavinia. 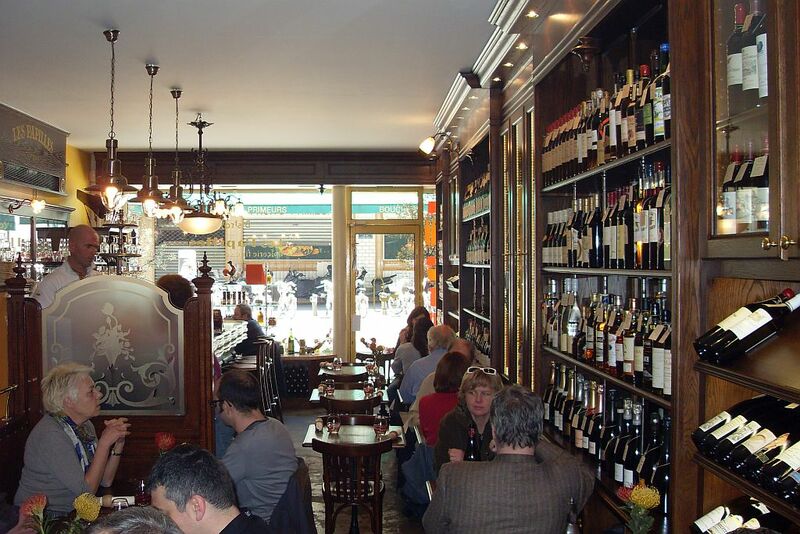 This is a tiny wine store with about 20 seats jammed into it. You’ll eat surrounded by wine boxes and wine shelves. It’s a small menu, but what’s there is good with an unusual selection of wines. On one visit they were serving Napa Valley’s Schramsberg blanc de blancs by the glass. Mon Dieu–California wine in Paris!!! Les Papilles. (5th Arr.) 30 Rue Gay-Lussac. Another tiny wine shop with good food and wines by the glass. I prefer Juveniles, but it just depends on which one is closer when the clock strikes noon. Lazare. Parvis de la Gare St. Lazare. On the second floor (for Americans) and the first floor for Europeans of the Gare de Lazare train station. It’s a first-class kitchen run by chef Eric Frechon (La Verrier, Restaurant Frechon, Le Bristol, Le Crillion). It opened September 2013. Service is everyday from 7am to midnight. But don’t be fooled, this is France; I arrived at 3pm and the kitchen was closed; but my lunch was a delicious charcuterie plate and cheese selection at the bar. Wines by the glass are very good: mine included a Cru Beaujolais and a red Sancerre, both poured from magnums. 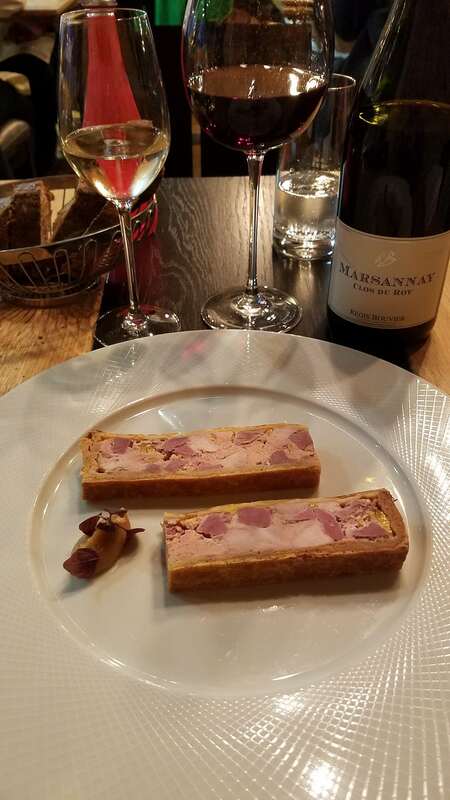 In June 2014, my lunch was country pate, coq au vin, a glass of each rose’ Champagne and Morgon. And again in October at the communal table, the roasted pigeon and fall mushrooms were outstanding. A year later, two glasses of Duval-Leroy Champagne accompanied another delicious lunch of succulent gigot d’agneau (leg of lamb) and mussels in a curry broth. 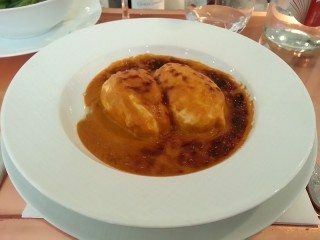 And again, two years later (April 2016) I enjoyed the classic quenelles de brochet to my (now ususal) place at the bar. Not to be forgotten was the bright and fresh haricot verts and white mushroom salad. After lunch take the escalator downstairs to Jeff de Bruges for a box of Belgian chocolates- the best country in the world for chocolate candies. Porta 12. (10tharr.) 12 Rue des Messageries. As of October 2015, this was the newest lunch spot on my list. It has only 12 tables, and la porte (door) is easy to miss as this is a small restaurant on a quiet side street. But don’t miss it: here, you’ll find high quality cooking, young English speaking and friendly staff. 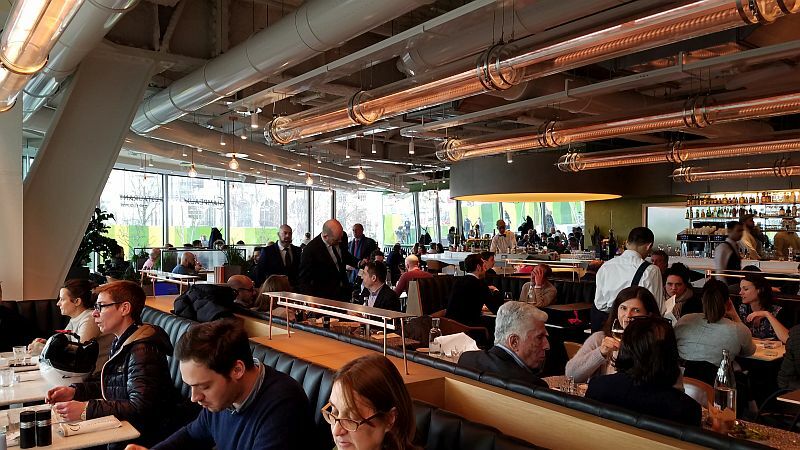 There are two lunch menus: three courses for 35E and five courses for 55E. No choices; you choose one or the other, and chef makes the menu. 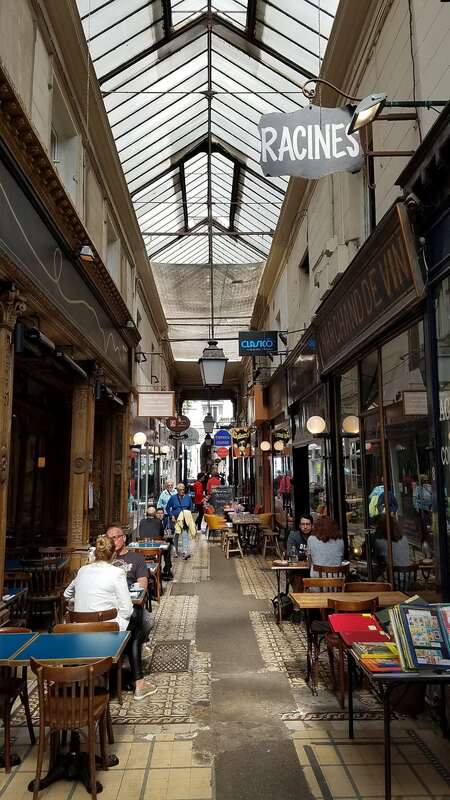 In 2017, while riding my bicycle on Rue Vivienne, I saw the “Passage des Panoramas” Paris’ oldest glass-covered arcade. I immediately recalled that Racines (2ndarr. ), the white-hot bistro of 10 years ago was located there. I chained my bike to a pole, entered the arcade and found Racines. It was half empty. The plate of supermarket-quality salami with brown bread and a glass of mediocre Champagne explained why. But what a difference a new chef makes! 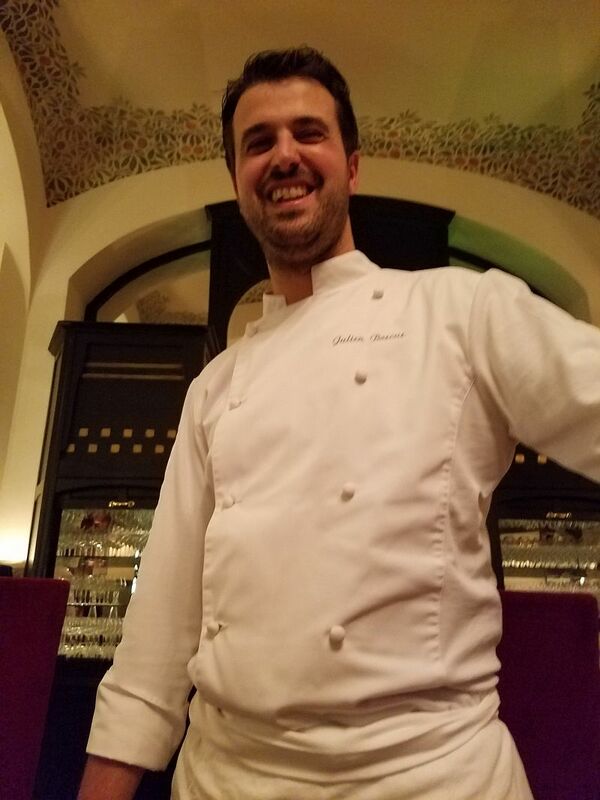 I returned in April 2018 to find Chef Simone Tondo commanding the kitchen. Tondo, who hails from Sardinia, was the sous-chef at Racines some six or seven years ago when Racines was on every “must eat” list. 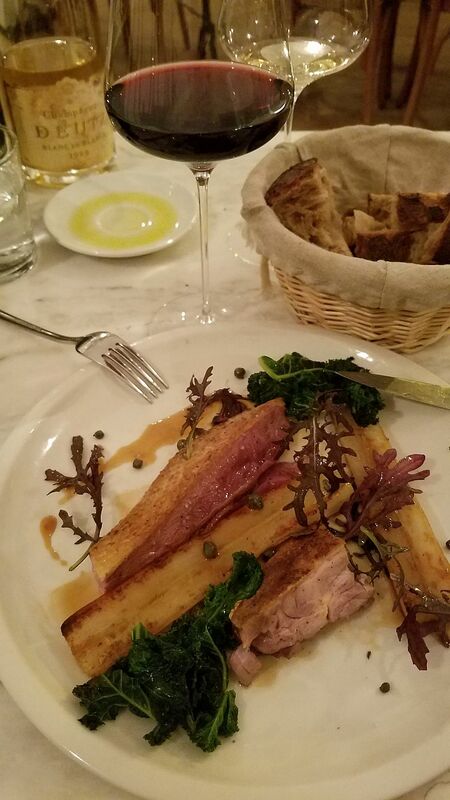 So, following the adage “when in Rome …,” I ignored the Boudin Noir and other French dishes and went with Chef Tondo’s Italian offerings, such as the Vitello Tonnato. The velvety pink veal carried a coating of tuna-infused mayonnaise that showed that while Tondo is Italian, he knows how to make mayonnaise as only someone who worked under a French chef can. And why order the typical French presentation of a filet of haddock with cauliflower when you can feast on chef Tondo’s savory spring treat of al dente green tagliolini with firm pieces of green asparagus and parmesan? I also suggest forgoing the Saint-Nectaire cheese or pear tart for what will be an awakening of how great the all-too-often mundane Tiramisu can be. Tondo’s rendition will show you how he can straddle two cultures with the French love of rich, thick whipped cream folded it into whipped mascarpone cheese, intense espresso, then laced with marsala. Rather than a dusting of cocoa powder, this was a serious (and delicious) snowfall. Chef Tondo’s Tiramisu is the ultimate tribute to his heritage, French techniques and your pleasure. The rejuvenated Racines (8 Passage des Panorama) will be worth your while. Gare au Gorille (17th). 68 Rue des Dames. The name tells you this is a restaurant with a sense of humor: Be careful of the gorilla. Located on a side street a few blocks from the Rome Metro station. I discovered this storefront with its industrial design (is this becoming the millennial generation trademark?) and pleasant young staff in September 2015 and found the food and service good, and the prices are fair. Lunch is three courses for 27 euros, which is a great deal. Two choices come with each course. The wine selection is organic, biodynamic and natural (the philosophy is free). I love Beaujolais, so the 2011 Michel Guignier, Beaujolais, La Bonne Pioche was spot-on. 52 Rue du Faubourg Saint-Denis (10th arr.) is the address and name of the industrial-looking café to which I rode my bicycle for lunch instead of waiting for the housekeeping staff to prepare my hotel room. A glass of Chartron-Taillet Cuvee St. Anne Champagne, made by a 30-something winemaker and owner of the Champagne house matched the age of every customer and staff member–save yours truly. The calamari with avocado puree went well with the Champagne, then the main dish of Dorado filet and eggplant puree called for a second glass of the Cuvee St. Anne. Was the lunch worth a two-mile ride in each direction? No, but it was beautiful blue-sky Paris day and a much better way to pass the time than sitting in the hotel lobby. Au Bon Accueil (7th) 14 Rue de Montlessuy. Kigawa’s dining- room manager, Bertrand Verdier, gave me my October 2016 lunch discovery, Au Bon Acceuil. This charming restaurant was established in 1870, and has been family-owned since 1980. Two courteous, English-speaking waiters in bistro black apron and white shirt serve the chef’s modern version of bistro fare. 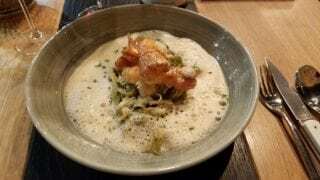 My 36-euro three-course menu began with fried sardines tempura-style with a lemon flavor that diminished the sardines’ saltiness while being mouth-watering. 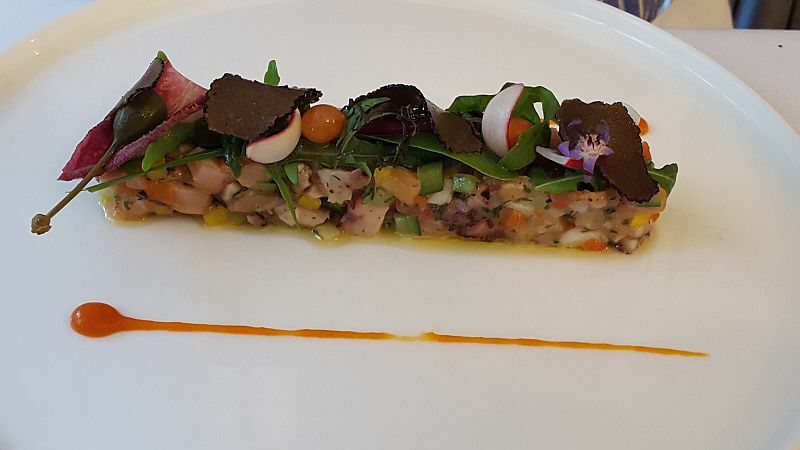 The main dish–Pave de Dorade or filet of bass, with a palette of tricolor peppers, cherry tomatoes and puree of potatoes–pleased the palate and the eye. A good selection of fairly priced wines included the biodynamic 2014 Domaine Pierre Cauvin Cremant de Loire Brut Nature, which was too tart as an aperitif, but balanced by both fish presentations. And deep appreciation went to the dessert course: brioche baked with autumn fruits and accented by passion-fruit foam and garnished with a wedge of persimmons. Only two streets away from the Eiffel Tower, Au Bon Accueil is nearly in its shadow. Yet, it maintains a local appeal. Indeed, this is the kind of restaurant every neighborhood should have. La Bourse et La Vie (2nd) 12 Rue Vieienne. 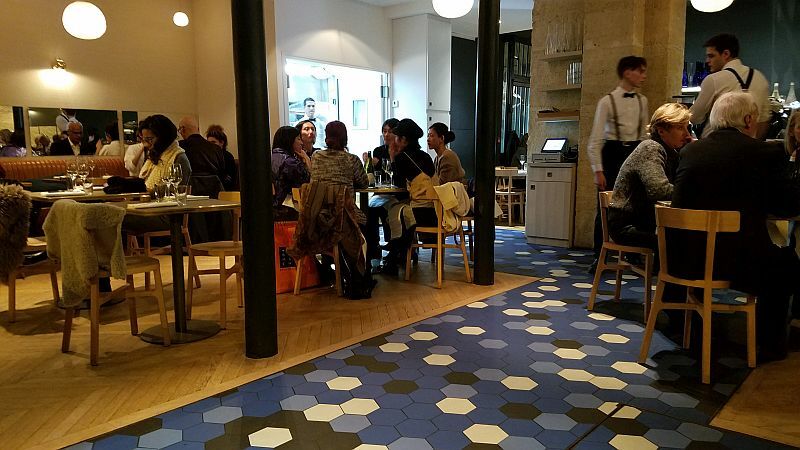 This 17-seat restaurant is another successful gem by American chef Danny Rose, whose restaurants in Paris (Spring, Chez la Vieille) and New York (Le Coucou) are praised on both sides of the Atlantic. The kitchen must be just as small as the dining room as it offered only four appetizers, three main courses, and three desserts when I dined there on the cold day in January 2017. From the limited wine list, I selected the 2015 Christian Venier, Le Clos des Carteries, a tasty blend of gamay and pinot noir. This single-vineyard Loire Valley wine is organically grown, fermented by carbonic maceration (a traditional method for Beaujolais’ gamay grape), and bottled free of sulfur dioxide. 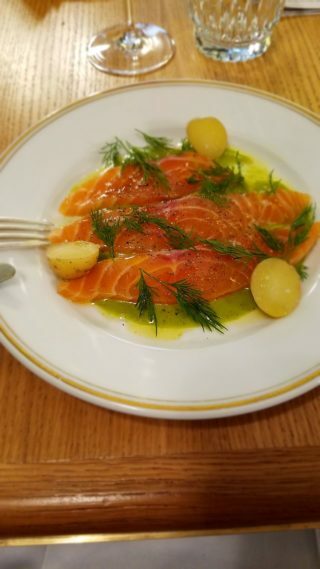 My gavlox appetizer was an unusual half-inch thick rather than the traditional paper-thin slices, which gave the delicious, silky salmon a texture I immediately preferred. The extra-virgin olive oil and dill sauce was a great replacement for the classic sour cream-dill mix. 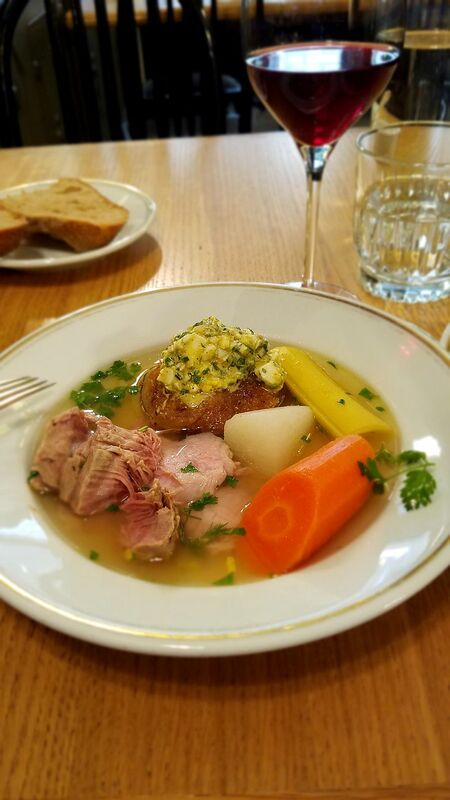 The veal pot-a-feu was the perfect dish for the coldest Parisan day I’ve ever experienced (26 degrees F at noon). From the large copper pot served to me, I pulled forkfuls of fatty veal, root vegetables, and used the crusty brown bread as a sponge to drain the pot of the savory broth. The dish was worth every cent of its 32-euro price. A velvety dark-chocolate mousse laced with crushed espresso beans supplied the energy to move me out of my wood chair and into the cold. But I was glowing inside from the delicious lunch. Frenchie (2nd) 5 Rue du Nil. This tiny, one-star Michelin, 22-seat restaurant was the most difficult reservation to make in memory. But it was worth the year-long effort. In February 2017, it’s L-shaped dining found me sitting alongside the Rue de Nil window at the rear of the room. From that vintage point, I watched the supposedly nonchalant, but in reality, professional millennial-aged service staff while sipping a glass of a heretofore unknown Champagne: Fallet Prevostat, Blanc des Blancs, non-dosage. Its rich, white nectarine flavor finished with a mineral kick. My sea scallop carpaccio appetizer with oyster mayonnaise, quartered and pickled radish, and fried black rice was delicious on its own and perfect with the second glass of my new acquaintance, Fallet Prevostat. A sautéed chicken breast arrived with what I consider the silliness of modern cooking: a single grilled leek, a single shaving of a carrot (but not the carrot), and a single grilled salsify. It all tasted good, but I prefer food over abstract art on my plate. My glass of 2014 Crozes-Hermitage, Alain Griollot provided a splendid middle ground between the intense flavors and weight of Hermitage and Chateauneuf-du-Pape. A tour of lemon was a refreshing dessert: hidden under the Meyer Lemon Curd was the diced lemon itself sealed with a rosemary-flavored gelatin. Clever and tasty it was. Unequivocally, Frenchie was worth the effort. 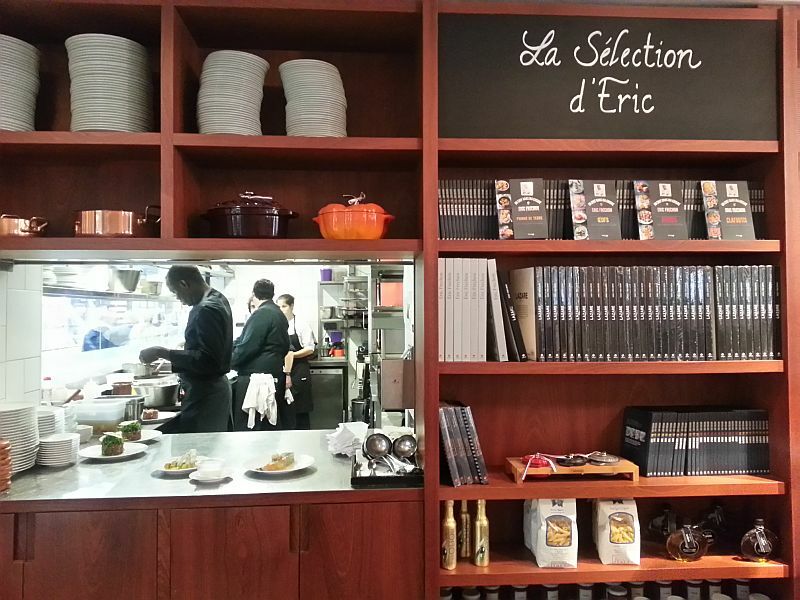 Ze Kitchen Galerie (6th) 4 Rue des Grands Augustins. 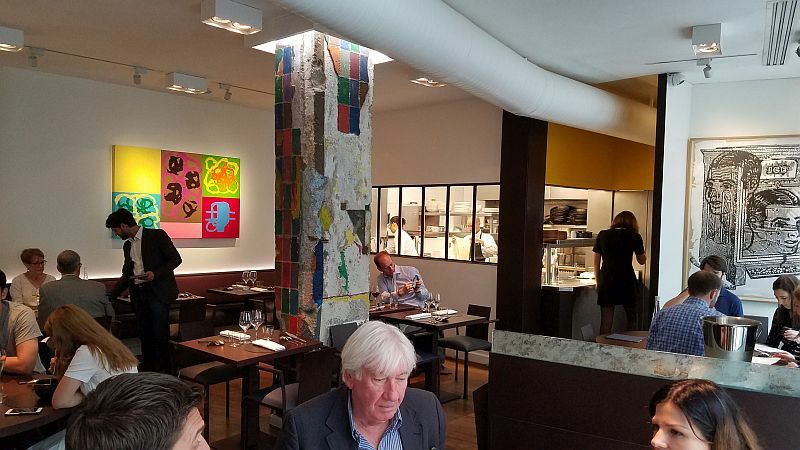 What a pleasant surprise was this one-star Michelin: I went there in July 2017 expecting the restaurant was part of or adjacent to an art gallery. There were paintings on the walls (by friends of the owner, but not for sale). But I found the real artistry was in the kitchen, where a team of chefs and cooks (not one is over 26 years-old, I was told by the 20-something dining-room manager) are creating their portraiture with colors as brilliant as Murano glass, flavors with the density of a Jackson Pollock painting, and a blending of French and Asian flavors that Gauguin would have wished he ate during his time in Tahiti. 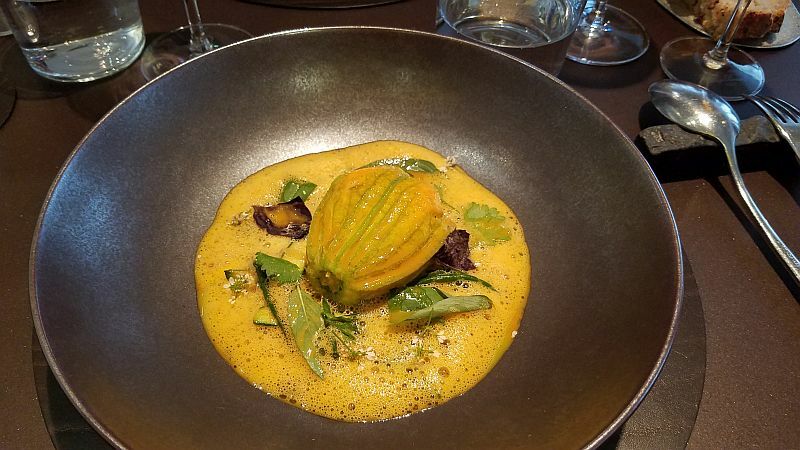 Take the appetizer of a zucchini flower stuffed with a shrimp mousse in a buttery shrimp broth seasoned with miso-harissa, surrounded by embryonic zucchini sliced in half, making Lilliputian raft-sized images. It was as visually-appealing as any Monet and tasted so good I decided on the spot to have lunch there the following day, something I have never done before. The menu is a set of formulas: the first day I choose two courses, appetizer and main course; the second day I choose main course and dessert (either is 41E). There are also three-course and six-course options. The next day, my turbot with the tinniest griolle mushrooms, steamed and sliced potatoes, green beans, cream foam, and a necklace of green herbs and puree only added to my appreciation for the kitchen’s gallery of talent. The garnet cherry sauce was the eye-catching and palate- pleasing background to the brilliantly conceived dessert of intensely flavored cherries, sliced apricot, candied basil leaf and pistachio ice cream. It was a masterpiece. Put Ze Kitchen Galerie on your Paris “must eat” list. Champeaux (1st) Forum de Halles. A 21st-century Parisian brasserie owned by Chef Alain Ducasse, who has enough Michelin stars to have his own galaxy. 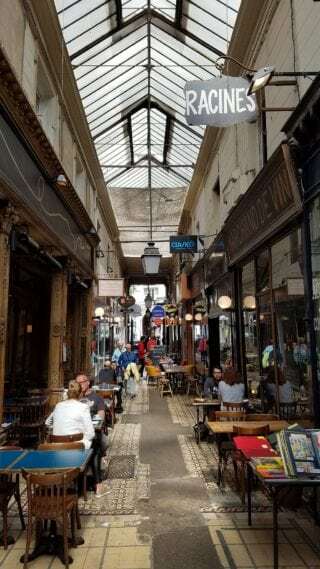 Located on the ground floor of Paris’ new three-level subterranean shopping center, train station and metro station in what was the city’s meat market, Les Halles. In January 2017, I started with a glass of Fleury Rose’ Champagne. A long-time favorite, this biodynamic-farmed vineyard and winery makes superb Champagnes. While sipping the Fleury, I choose the most classic of all French bistro dishes: steak tartare. But I was not happy with the serving of unseasoned chopped beef. MIA were the traditional condiments: chopped gherkins, capers, mustard, Worchester sauce and crushed black-peppercorns. Only the delicious thick, dark brown bread that I requested be toasted made the dish acceptable. A glass of Stephane Montez Collines Rhonaniennes “Syrah a Papa” was filled with the black-fruit pleasure that northern Rhone wines are known for. Collines Rhonaniennes are great value syrah wines, look for one when red-wine shopping. Les Temp au Temps. (11th arr.) 13 Rue Paul Bert. Excellent food, be prepared to talk to your neighbor because your neighbor’s table is 6 inches from yours–and it’s a minuscule room . The wine list is limited but good. If you like this kind of ambience, you’ll enjoy it. Otherwise don’t go. La Braisiere: (17th arr.) 54 Rue Cardinet. One-star Michelin. 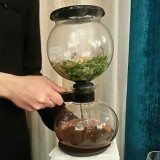 Had enough of tiny casual restaurant recommendations? Here’s one that has about a dozen tables with flowers and paintings dressing the room, and where you wear your nice dress or jacket. 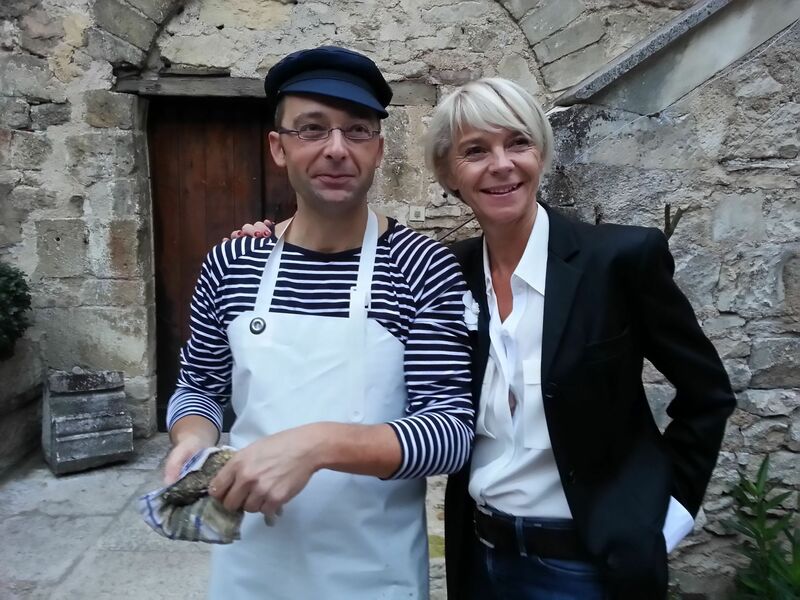 Staffed by women and directed by chef/owner Jacques Faussat, service is attentive but never obvious. The food is always excellent, the wine list reasonable (with half bottles of Champagne when I’m traveling alone) . Au Trou Gascon. (12th arr.) 40 Rue Taine. This one-star Michelin restaurant has an excellent wine list, very comfortable and “nice dress and jacket” room, attentive service and excellent wines at very fair prices. 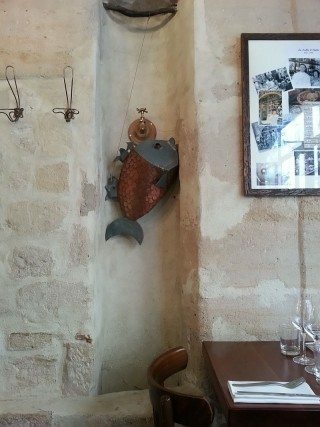 When I dined here in April 2013, I had a great dinner with outstanding wines: 1999 Deutz Cuvee William Champagne and 1999 Morey St Denis, “En la Rue de Vergy” Bruno Clair. Both reaffirmed the level of excellence of the 1999 vintage in Champagne and Burgundy. 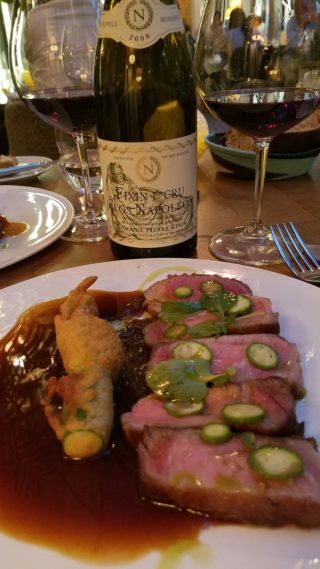 When I returned in September 2013, another delicious dinner with 2002 Rene Engel Vosne Romanee– another great Burgundy vintage. This restaurant is out of the way, but should be on your must-visit list. My return in 2014 resulted in yet another enjoyable dinner: Partridge filet with cepes, followed by wild rabbit (hare) and foie gras, which was perfect with the 1999 Domaine Geantet-Pansiot Gevrey-Chambertin,V.V. February 2017 found me at a corner table enjoying a half bottle of nonvintage Billicart-Salmon Rose’. Little did I know that would be the highlight of my dinner. A small disc of smoked salmon with a salmon-flavored crème was a banquet-styled amuse bouche not befitting a one-star Michelin restaurant. Nor did the appetizer improve my mood: nearly tasteless black truffles and two slices of foie gras did nothing for the artichoke leaves and cheese that were in a wonton-style wrapper. 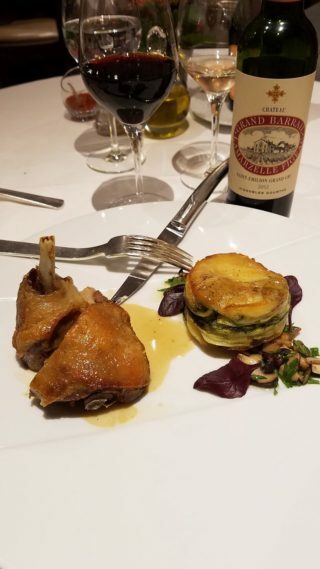 My half bottle of 2012 Chateau Grand Barrail Lamarzelle Figeac, St. Emilion Grand Cru emitted smoky, toasted oak and black-tea and black-fruit aromas and flavors that befriended the main course of roasted duck leg with a galette of potato. Depending on your point of view it was either a very traditional presentation or lacked imagination. 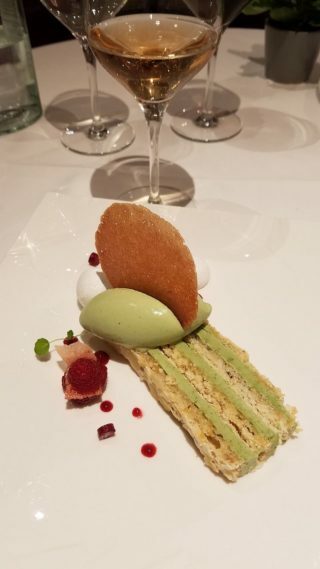 The young server delivered the Dacquoise lined with pistachio cream, and a scoop of pistachio ice cream and a garnish of two (2) raspberries. 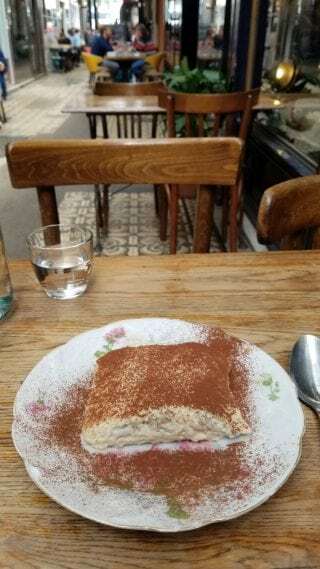 While the Dacquoise was tasty, it did not change my impression that Au Trou Gascone needs to update its food approach. And that my dinner certainly did not earn one star. Les Fables de La Fontaine. (7th arr.) 131 Rue Saint-Dominique. The pleasant, small dining room of this one-star Michelin restaurant seats about 25, and has very good food and an acceptable wine list. Décor is more than jeans but less than your best dress. . Le Christine (6th arr.) 1 Rue Christine. Pretty neighborhood restaurant with attentive service, good food, and decent wine list. The kind of place you want for a relaxed dinner with friends. Les Climats. (7th arr.) 41 Rue de Lille. 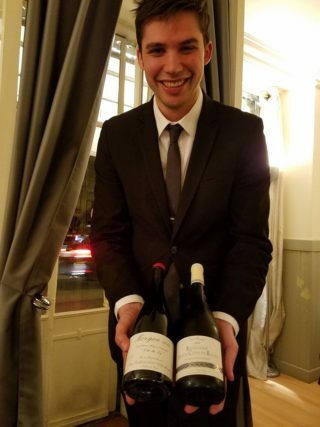 This was my best discovery in 2013 with its monumental wine list dedicated to Burgundy ( A climat is the French term in Burgundy for a plot or a vineyard that has a definitive soil, climate or slope) , excellent food, and great service by Franck, the enthusiastic sommelier. I loved my Simon Bize Savigny-les-Beaune “Les Bourgeots” 2005 for two reasons: It was delicious, and it was 59 Euros. I can’t wait to go back. Oh, the dining room is two rooms: front is a red-velvet chair, dark wood ambience; the back room (which I prefer) is Cape Cod wicker white chairs; and when the weather is accommodating, there is garden dining in more wicker white chairs. Go there but don’t drink my Simon Bize !!! I dined here twice more in 2015. No more Simon Bize, but there is a cellar full of Burgundy gems in wait. The one I selected after consultation with the female sommelier: 2008 Domaine Pierre Gelin, Fixin, 1er Cru Clos Napoleon. It’s a monopole, the French term for a single-vineyard, and from a vintage that is unjustly overshadowed by the brilliant 2009 red burgundies. Returning in October 2016, I found a newly decorated dining room in the rear of the restaurant. 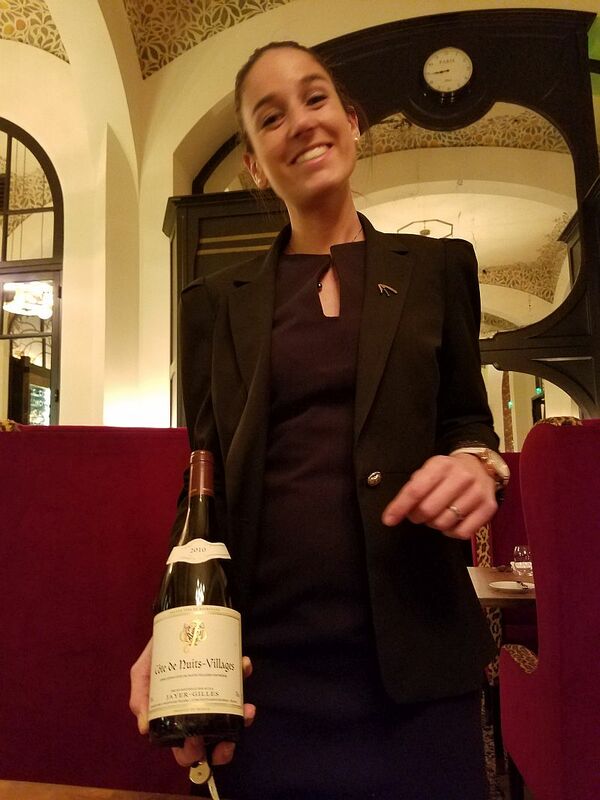 Sommelier Johanna Tichadou-Messere decanted our 2010 Jayer Gilles Hautes-Cotes de Nuits whose cranberry-strawberry fruit flavors and acidity was perfect with chef Julien Boscus’ delightful fall dish of grouse, wild mushrooms and puree potatoes. In July 2017, I ordered a bottle of the 2008 Louis Bouillot “Perle d’Or” Cremant de Bourgogne from my table in the conservatory room, my favorite of Les Climats’ two dining room. A delicious amuse-bouche of baby mussels, fried potato sticks in a buttery broth flattered the richly flavored Bouillot sparkling wine. 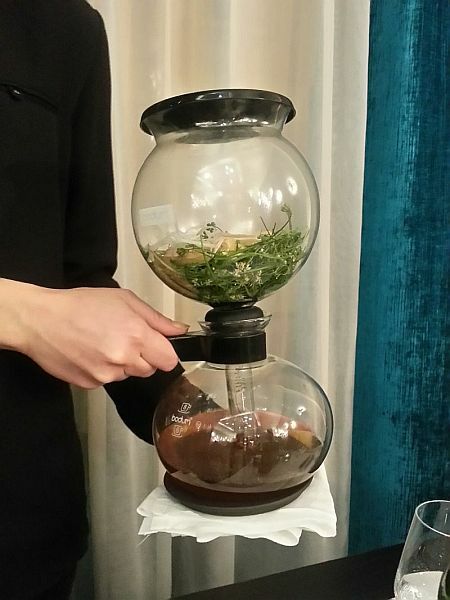 Chef Julien Boscus’ delightful, and creative appetizer of crab meat, marinated artichoke, embryonic shrimp, and celery broth showed how the right food elevates a wine. 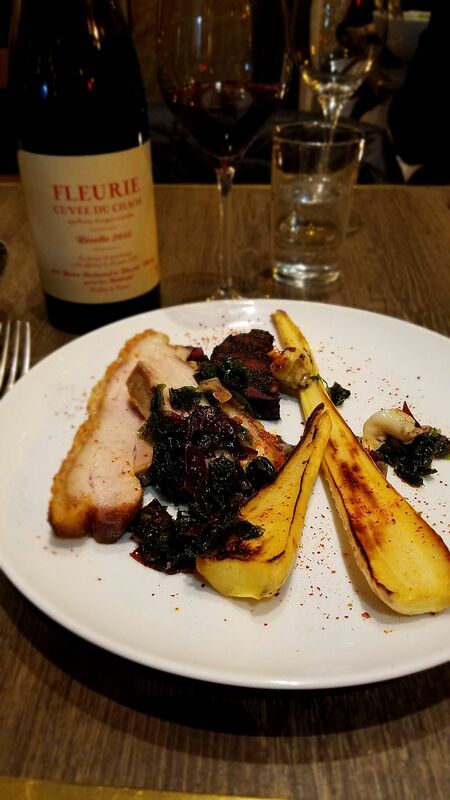 My Iberian Pork with a red-wine onion confiture, and zucchini with its flowers stuffed with ricotta cheese, was cooked perfectly, but lacked the spark of many other main course dishes I’ve had during four years of dining at Les Climats. I think the onion confiture was too sweet and only magnified the pork’s richness when a counterpoint was needed. From Les Climats extraordinary wine list, devoted only to Burgundy wines, I selected the 2008 Domaine Pierre Gelin, Fixin, 1er Cru, Clos Napoleon to join my pork main course. The 2008 vintage is ideal to drink now. It’s been overshadowed by 2009 and 2010, but don’t skip it. There are many delicious 2008s, as was Gelin’s Fixin. I finished dinner with an excellent selection of cheese and the Fixin. Once again, the attentive service of Les Climats staff and owner/partner Carole Colin made for another pleasing evening at Les Climats. 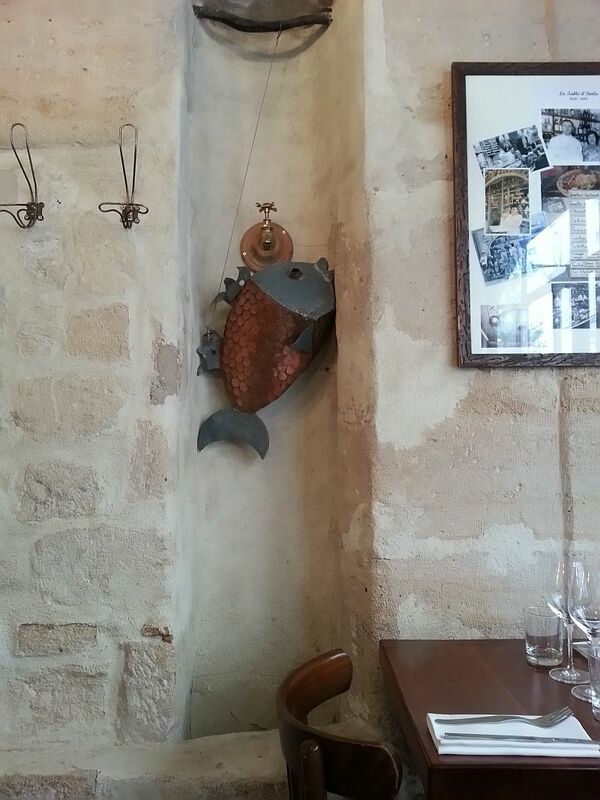 If you love Burgundy wines, than your next trip to Paris must include a reservation here. And sure enough it happened: I had my table the following fall where the 55-euro seasonal menu featured a generous foie gras portion; a main course of wild partridge with mushrooms and chestnuts, with support from a 2008 Domaine Geantet-Pansiot Chambolle-Musigny and a 2008 Clos Rougeard, Samur Champigny from the extensive wine list. Few Americans are aware of the delightful cabernet franc wines of the Loire Valley’s Samur Champigny appellation, and fewer still of the first-rate Clos Rougeard. Chez Monsieur. (8th arr.) 11 Rue du Chevalier Saint-George. Near the Madeline, this classic-styled bistro is owned by the same partners of Les Climates (Carole Colin and Denis Jamet). June 2014 found me sipping a glass of Alfred Gratin blanc de blancs before enjoying a first course of sauteed girolle mushrooms with garlic butter and toasted hazelnuts; couldn’t be more typical bistro and very tasty. My main dish of turbot with potatoes tossed with onions and chives went down well with a bottle of 2010 Domaine Diconne, Auxey-Duresses. Good fare and ambiance. And go back I did: another superb dinner the following May. 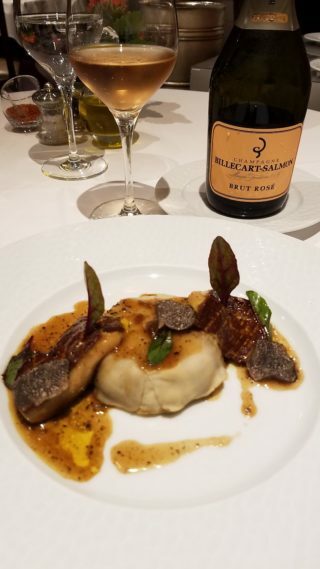 By now, the tradition to start with a half-bottle of Laurent-Perrier was established and enjoy with an appetizer of white asparagus and morel mushrooms. That was followed by spring lamb with artichokes and a bottle of excellent 2012 Bourgogne Rouge from Domaine Anne Gros. Five months later my dinner started with a glass of Jacques Lassagne Champagne, then moves to the fall menu of a fricassee of cepes with bacon, blending the buttery mushrooms and pork flavors. 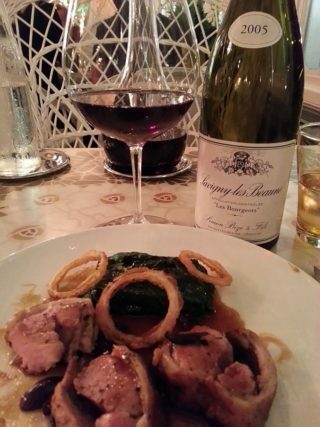 The main dish of a rack of Iberian pork is as elegant as the 2014 Bernard Baudry, Chinon, “Les Granges”. 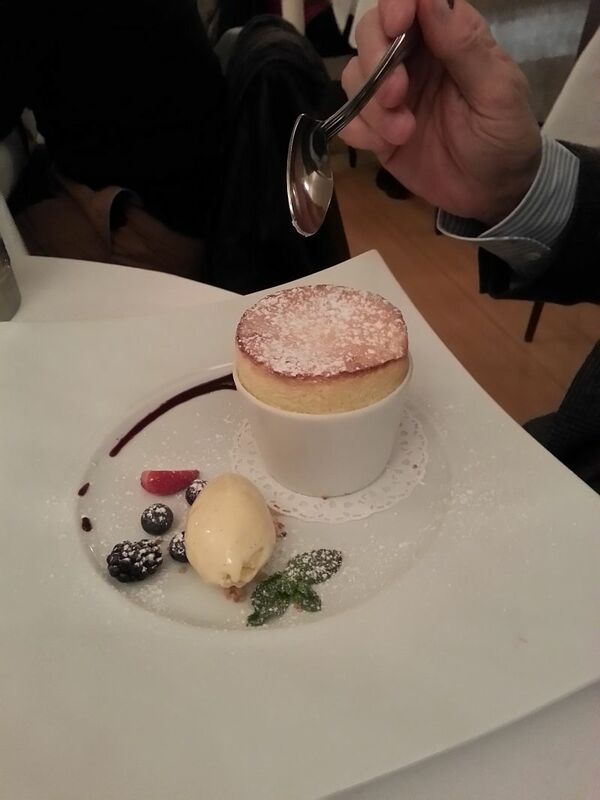 And when was the last time you had a chocolate soufflé for dessert? For me, it was much too long after Kigawa’s. But “too long” wasn’t repeated: Just six months later, a perfect caramel soufflé was delivered to my table in April 2016, preceded by a toothsome pork, foie gras and sweetbread pate, and a roased squab pigeon. 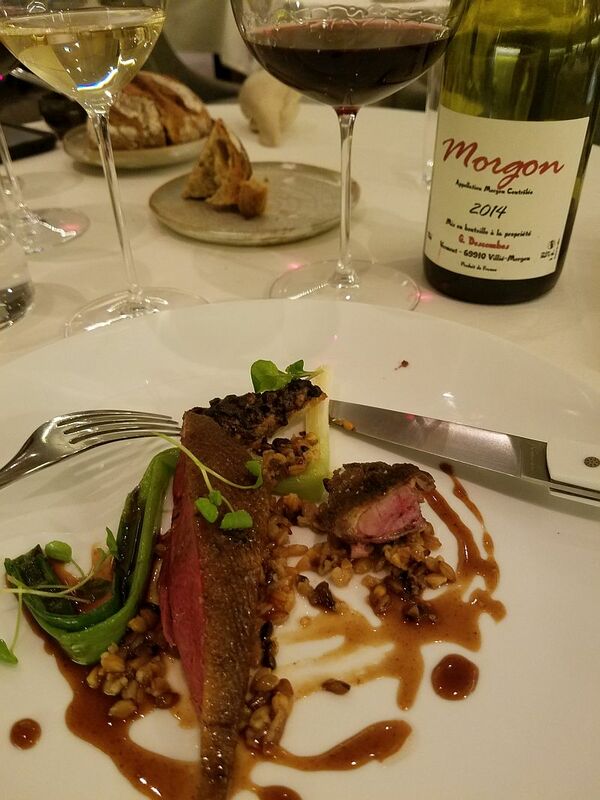 A bottle of Delamotte Brut Champagne– perhaps the best value on the market– and the 2014 Marcel Lapierre, Morgon, Cru Beaujolais rounded out another great evening in this jewel box. And Michelin has yet to award this excellent restaurant with one star. Quelle dommage! Pastry chef Junko Kigawa’s Caramel Souffle. October 2016 found me in a perfect universe of flavors when chef/owner Michikiro Kigawa sent out the raw shrimp and Dourade Royale tartare with radish shavings, capers and radicchio. It was fresh, pure and delicious; I matched it with a glass of Philipponnat Brut Zero. Later, dining room manager Bertrand Verdier poured Jean Folliard’s 2014 Morgon “Cote du Py.” Its rich, blackberry, cranberry and white-pepper flavors flattered chef Kigawa’s savory fricasse of lamb. Yes, I like this place. If I’m in Paris, you’ll find me here. And there I was again, in July 2017 enjoying a glass of Taittinger Champagne with Chef Kigawa’s tasty shrimp and julienne radish amuse-bouche. The salmon and octopus tartare with the tiniest tomatoes and brunoised zucchini was a flavorful appetizer and well matched by the half bottle of 2015 Jean Durup, Domaine du L’Eglantiere Chablis, 1er cru Montee de Tonnerre with its rich fruit flavor and mineral, limestone backbone. And the roasted pigeon with girolle mushrooms and a giant lobe of foie gras was wonderful with the 2014 Alphonse Mellot, Petite Moussiere, Sancerre Rouge–a wine that more people should get to know. In top vintages, this pinot noir has the crispness of the white Sancerre and a savory, spicy cranberry-like flavor that is delicate on the palate and long in the finish. My curiosity made me order the Yuzu-flavored nougat ice cream with blueberries and baked meringue sticks. I was rewarded with a tasty lemon-accented nut ice cream, and another delightful dinner from Chef Kigawa. Garance (7th arr.) 34 Rue Saint-Dominique. My newest adventure was awarded one Michelin star in 2015. Two small rooms upstairs, one is a depressing grey (why would anyone paint a dining room grey?) with artless walls; the other is a brighter white with a small, glass wine room. 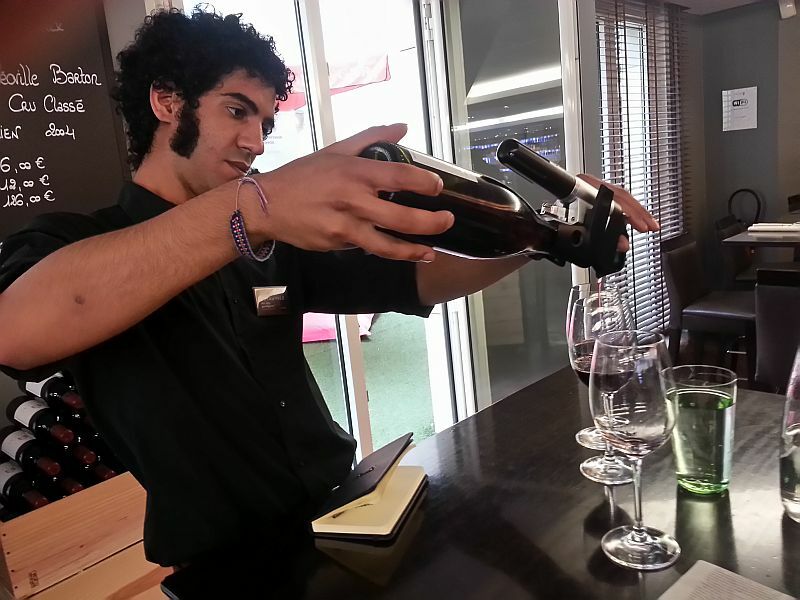 The young staff is pleasant and the sommelier is upbeat about his wines bearing fair prices; the menu is a la carte with a limited selection of four appetizers, three main courses and two desserts. 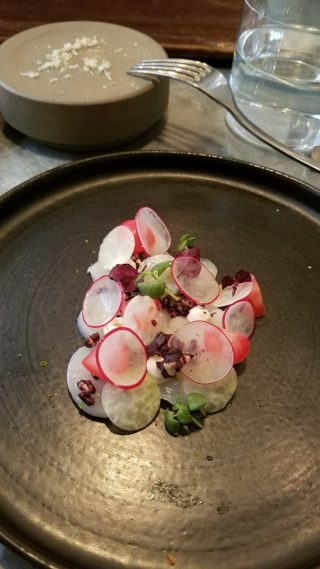 Not exactly what I expected from a one-star restaurant. 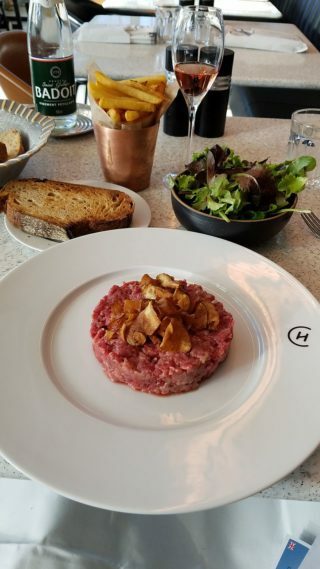 But the horse tartare recalled my time living in Brussels where horsemeat is a regular menu item. It was good but the red beets and plum juice was too odd for me. 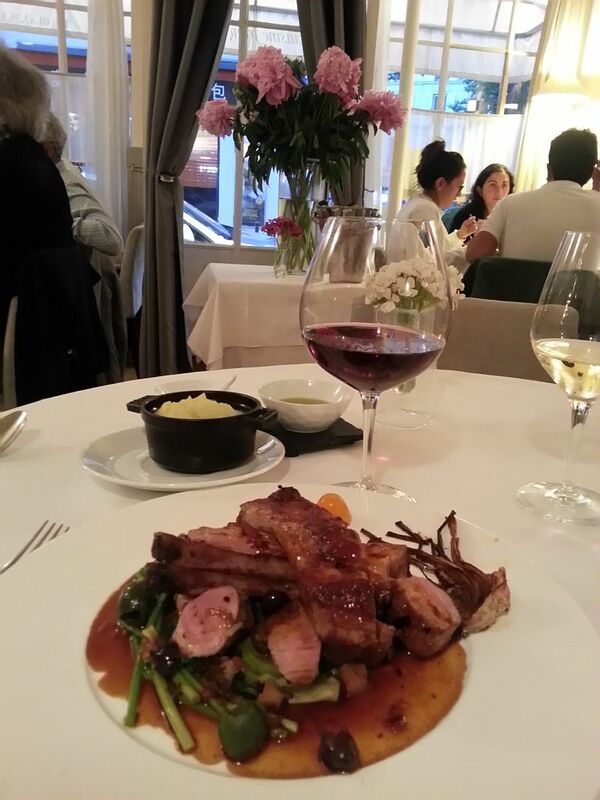 The main course duck is no better than others; not a one-star dinner. Kigawa is twice as good with no stars. Go figure. Amarante (12th arr.) 4 Rue Biscornet. This small bistro is on a side street with very reasonable prices. It’s worth the search for the Boudin de Couchon, a pig’s blood sausage with such intense flavor that small bites are required. A bottle of 2012 Claire Noudin, Hautes Cotes de Beaune was succulent and the quintessential Burgundy. Restaurant Louis (9th arr.) 23 Rue de la Victoire. My first visit was in September 2015. This little jewel box is going for the Michelin star constellation. I have no doubt the chef will get at least one very soon; the food is creative and very good. Lots of little touches that Michelin will love and you’ll be pleased with, too. Menu at lunch is three courses; dinner is either six or eight courses (but think French fine dining sizes, not American plates). Service is perfect, the wine list small but you’ll find something to enjoy with dinner. My choice was the savory 2010 L’Etoile de Bergey, the second-label of Ch. Haut Bergey, Pessac-Leognan. 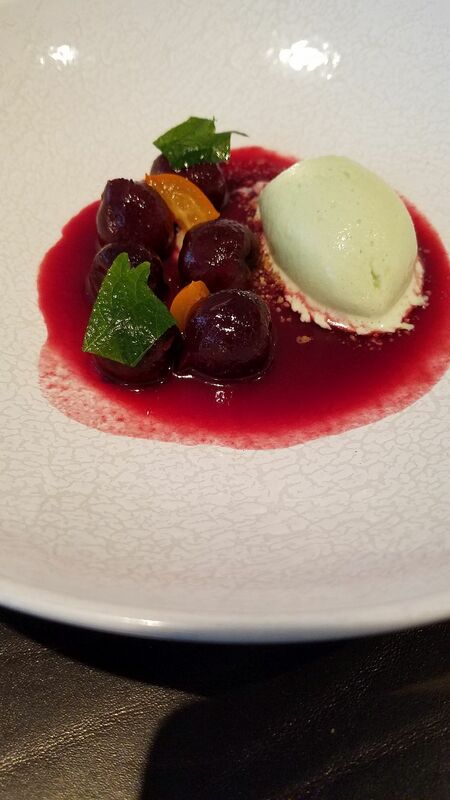 Another new star appeared in the 2015 Michelin Paris restaurant galaxy: the Italian cuisine Penati al Baretto (8th arr.) 9-11 Rue Balzac. Its bourgeois location features a cushioned dining room with a multilingual manager and a sommelier who forgot the art of smiling even when you are not enjoying your job of serving your customers. Robotic they are; but the chef is not. From my April 2016 dinner, the spring asparagus risotto was properly al dente and bursting with flavor; and the baby lamb leg for two was sheer and succulent. The 2014 Cottanera Etna Bianco and Rosso wines were good companions to the chef’s work. I’ll return when the dining room staff is more welcoming. As a former restaurateur, I know the value of a colleague’s recommendation. 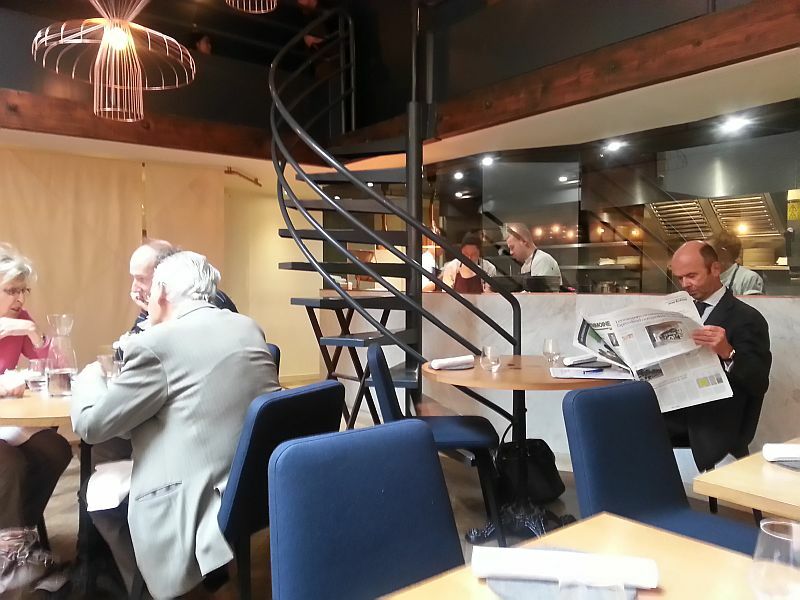 So, I followed up on Bertrand Verdier’s tip: Alliance 5 Rue de Poissy (5th). 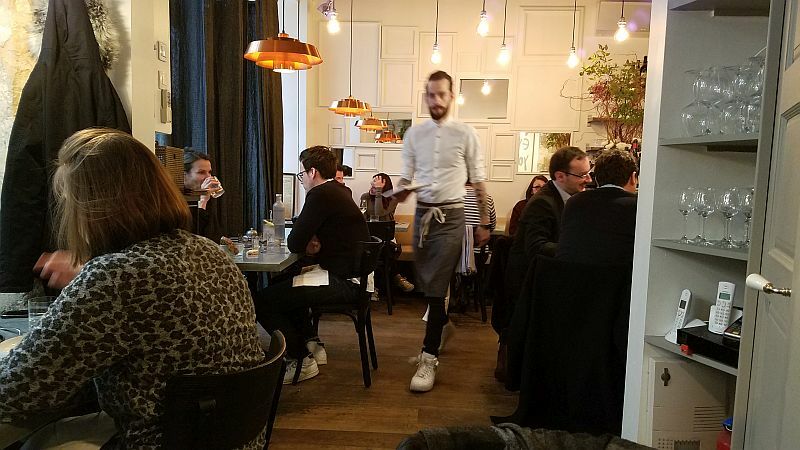 This is what new, chic, upscale Paris restaurants look like: Open kitchen at one end of a room with generously spaced white tablecloth-dressed tables with millennial-generation waiters in sports jacket and open shirt collar. 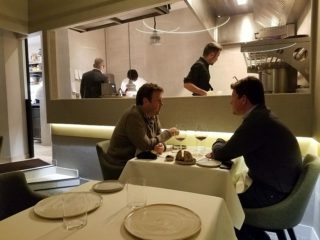 I selected the 75-euro six-course dinner (tell the chef what food allergies you have, and he’ll create a surprise work-around). After the amuse-bouche of an elegant red-pepper puree served in an industrial-architecture-inspired crock, a single oyster buried under an avalanche of crème fraiche and slivers of fried onion and lemon zest made the first course. 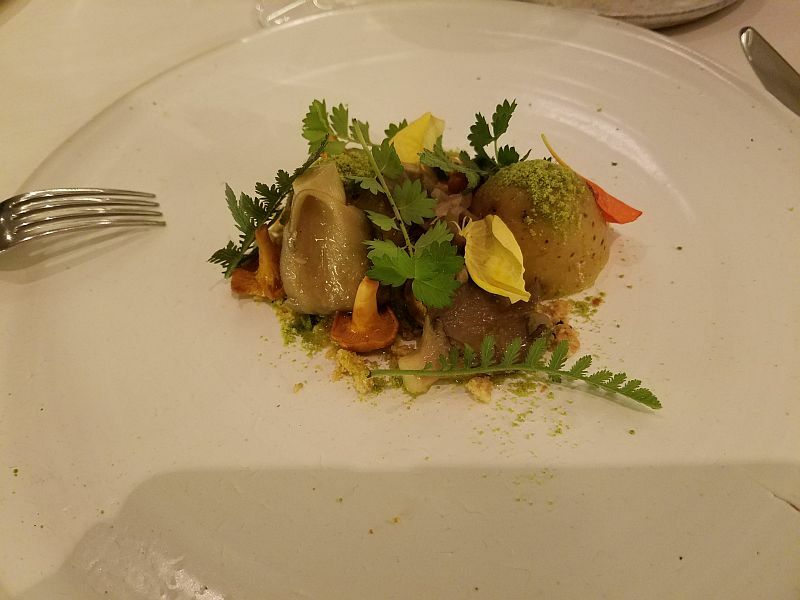 The vision of a forest floor appeared when the chef sent the second course of oyster and girolle mushrooms and steamed potatoes covered with fern-like green herbs, green powder—which I suspect was created from drying and pulverizing herbs–and tiny flower pedals. Its wilderness tasted so good, I recalled how much I enjoyed my Boy Scout days in the woods with my tent and sleeping bag. Then came the fish course: Bar filet (sea bass) with more flowers, and cauliflower in white, yellow and green renditions. It was followed by foie gras wrapped in bright green Swiss Chard centered in a bowl with beef broth, garnished with a single slice of carrot, leek and potato. Then the meaty, wild duck with its elegant texture and aged beef taste, alongside the ancient grain, spelt. Finally, the dessert: milk chocolate praline crust that seemed like a raft afloat in a lovely pool of coffee-flavored Crème Anglaise and capped with vanilla ice cream. In an era of dining rooms with bare table tops, ear- splitting noise levels, Alliance reminds you that dining is more than eating. It’s about conversation without shouting, tasting ideas inserted into food, and service that discreetly says the time is yours. Papillon (17th) 8 Rue Meissonier. This double storefront of blond unpadded chairs and simple wood tables set the stage for modern bistro fare on another cold night in January 2017. My glass of 2015 Lise & Bertrand Jousset Montlouis “l’Appetillant” had the rich chenin blanc fruit and stony, mineral backbone that makes this area’s sparkling wine a personal favorite. 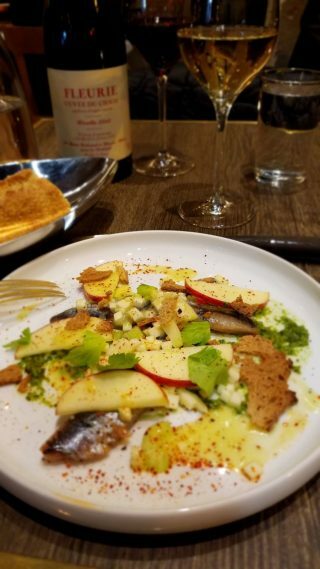 The smoked sardine appetizer with its slightly spicy “salsa” of celery, red apple, celery root and pureed parsley was a delightful introduction to Papillon. But the 2015 Fleurie, Cuvee de Chaos, Domaine Yann Bertrand was the new fashion of making Beaujolais’ gamay grape in a Burgundian pinot noir style. It’s all slick black-cherry and vanilla flavor to the exclusion of Fleurie’s floral and gamay (cranberry) aroma and taste. I wish wine publications would stop praising these ill-conceived wines, or restaurants would list them with a notation of the style. There is no way to know if you are getting a Beaujolais made with the traditional carbonic maceration, or Burgundy’s pinot noir winemaking process. Vantre (11th) Rue de la Fontaine du Roi, 19. With its gray-stone table top, wooden chairs and a few wall mirrors, it is not an understatement to say you might never take a second look at Vantre. 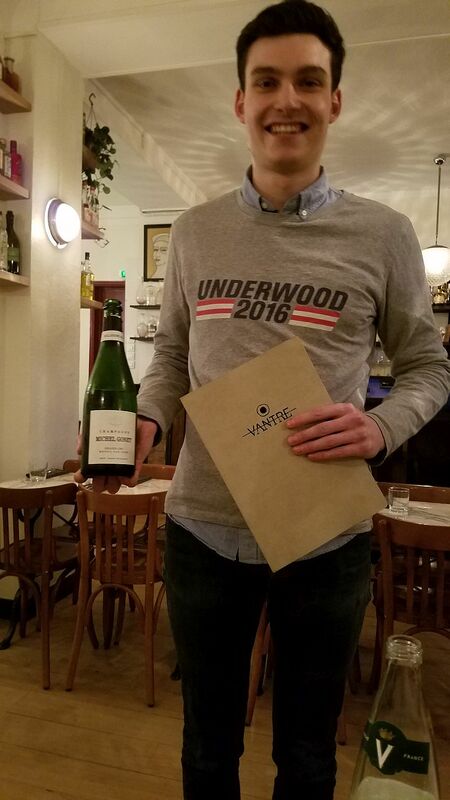 But if you are as passionate about wine as owner Marco Peller, you’ll take one look at the wine book that contains nearly 700 selections from his cellar and realize it is not an overstatement to say you’ll be a regular at Vantre. I would be. Focusing a 20-page, 700-bottle list requires time so I began the adventure on the first day of February 2017 with a glass of Vantre’s (or should I say Peller’s?) 2011 Michel Gonet Blanc des Blancs Champagne. I continued the blanc des blancs tribute with a bottle of 1998 Deutz. It was an excellent mate to the chef’s Tete Couchon (pate of meat from the head of the pig) served with shaved fennel, seaweed and buckwheat. A second course of feather-light gnocchi with a butter sauce was even better with the 1998 Deutz as the Champagne gained body and complexity with aeration and time. 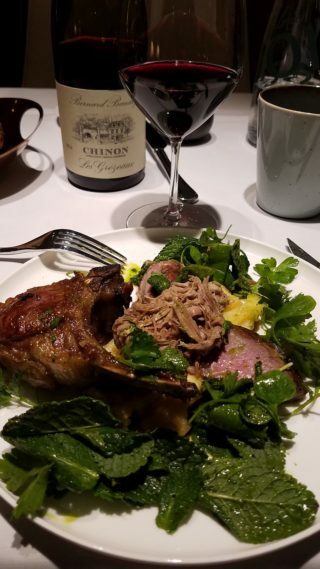 Then, the gorgeous black-cherry flavored 2010 Olga Raffault, Les Picasses, Chinon was perfect with the tender and delicious rare duck breast and confit leg served with slightly sweet parsnips. And to drink the outstanding Olga Raffault Les Picasses for 38 euros was a gift from the wine gods (or another from Monsieur Peller). The 24-year-old dining-room manager Thomas Simian is as enthusiastic about the list as I am. My only hope is there are still a few great bottles remaining when I next visit. April 2018: After four days of wine tastings in Burgundy, I arrived in Paris (after all, it was April, how could I resist?) and went directly to Ventre for dinner. Michel Gonet blanc des blancs was still the Champagne selection by-the-glass, so, in the spirit of my last visit, I ordered a glass. Having tasted a slew of 2015 and 2016 Burgundies during the week, I turned to that section of the wine book. Knowing the 2008 red Burgundies are drinking wonderfully, I ordered the Simon Bize, Savigny-les-Beaune, 1er Cru. Dining room manger and sommelier, Thomas Simian—whose passion for wine remains a joy to behold—recommended the 2010 Domaine Follin-Arbelet Pernand-Vergelesse, En Caradeux, 1er Cru. While I was familiar with the vineyard and the vintage, I did not know the domaine. Simian said it was minuscule and assured me the wine was excellent. Based on his contagious enthusiasm for the wine, I ordered it. 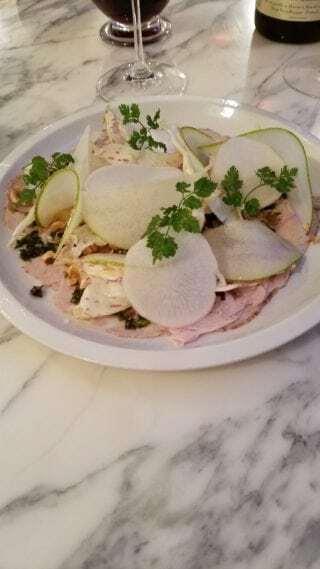 My dinner began with the classic Italian dish, Vitello Tonnato. The thinly sliced veal was coated with mayonnaise but without tuna. In its place, French flair was added with paper-thin wheels of Granny Smith apple, a shower of chopped hazelnuts and a floral-like arrangement of chervil. The visual stunning presentation was as flamboyant as a Missoni, or Dolce & Gabbana spring show. An Italian chef might accuse Ventre’s presentation of assassinating Italian cuisine, but if this is an assassination, then make me a martyr. The Italian tour continued with a tasty dish of buttered, parmesan-coated gnocchi. However, my pigeon with its properly cooked medium-rare breast was attached to a pair of dry, overcooked legs. But Simian’s recommendation was on target: after 20 minutes in the decanter, the 2010 Follin-Arbelet, Pernand-Vergelesse, En Caradeux was delicious. Dinner at Ventre is a great way to start a Paris visit. Restaurant Cleo’ (7th) 19 Boulevard de la Tour Maubourg (Hotel le Narcisse Blanc). All this comes with attentive service, a comfortable setting, and the excellent cooking of Montreal Chef Zachary Gaviller, who uses only biodynamic or organically grown ingredients. My dinner began with a glass of Billecart-Salmon brut Champagne with an amuse-bouche of an oyster with clementine sorbet and bergamont oil. It was a great, inventive start. From an equally fair-priced wine list I ordered a bottle from one of my favorite Loire Valley red wine producers: Bernard Baudry. His 2014 “Les Grezeaux” Chinon was silky with a rich black-cherry flavor and stony, mineral finish. 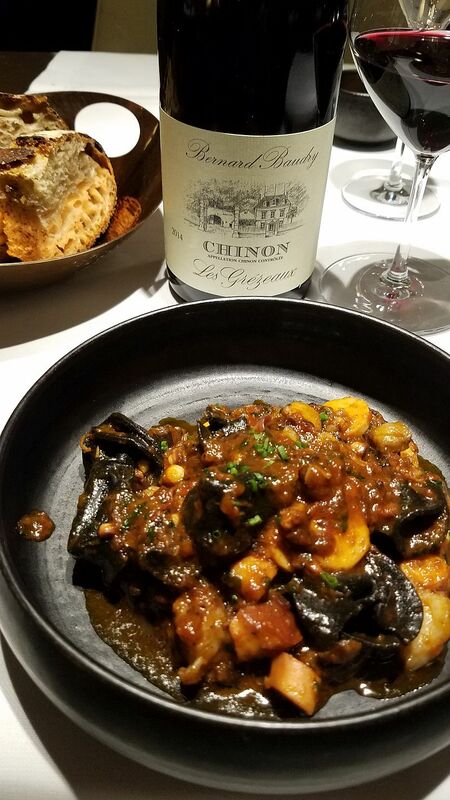 My first course of braised octopus with Sicily’s strigoli pasta, njuda (Sicilian salumi) and tomato sauce was outrageously good, and so perfect with the Chinon that I doubt any chef can make a better fish dish for red wine than what Gaviller served. The main dish of lamb two ways consisted of a double chop and slices of the leg buried under a shower of mint leaves and Italian parsley. As pretty as the green leaves looked, Chef Gaviller would serve his patrons better if he abandoned the English love of mint, and embraced the Italian understanding that rosemary flatters lamb. But tender and flavorful it was; French lamb is more subtle than American, and light years from the gamey Australian and beefy New Zealand lamb. Creamy Dauphiose potatoes elevated the dish. My last plate on this winter dining visit in Paris was an overly sugary celery pudding, kumquat confit with pecan nuts and raw cream; it was so sweet and sugary I had to send it back. It was replaced with a delightful lemon curd and Italian meringue and shortbread. It was as pleasing to the eye as it was to the mouth. Restaurant Cleo will see me again, and you should also have it on your dining list on your next Paris visit. Pirouette, (1st) 5 Rue Mondetour. Two streets from the gargantuan Les Halles metro station and food emporium (take the elevator for Rue Rambuteau), is this casual restaurant with an urban industrial décor where a creative amuse-bouche of minced sunflower seeds, chicken and octopus raised my expectations above Pirouette’s ambience. In July 2017, the first course of my three-course 45-euro menu brought a delicious rabbit “terrine” that was ground rabbit stuffed into a tortellini shaped like a rabbit’s ear. It showed chef Francois-Xavier Ferrol’s sense of humor and his serious cooking skills. Minervois is a southern France appellation, and my 2015 Minervois “Les Fontanilles” Anne Gros and Jean-Paul Tollot is made by a couple who come from two well-known Burgundy wine families. Their Les Fontanilles brought a velvety texture and black-plum color and flavor to the palate. It was a tad too big for my rabbit dish, but on the mark for my main dish: breast of pigeon lying in a nest of shredded potatoes with the liver pureed and shaped into an egg. And why have a single dessert when the chef sends a trio? Two scored high: A milk-chocolate (which I normally dislike) mousse with almond ice cream was very flavorful, and the pear ice cream with cardamom mousse and Matcha tea was outstanding. The only disappointment of the entire evening a watery Granny Smith apple sorbet. At the end of the evening, I was happy enough to do my own pirouette out the door. Kitchen Ter(re) (5th) 26 Blvd. Saint-Germain. 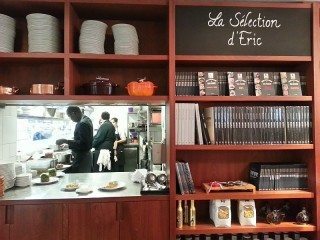 In July 2017 I was so pleased with my lunch at Ze Kitchen Galerie that before leaving Chef Ledeuil’s restaurant I booked a second lunch for the following day (read the review in the lunch section). That joyful memory was cut short in April 2018 by the attitude of one staff member at his other restaurant Kitchen Ter(re). Upon arrival, I made the rookie error of telling the woman at the reception desk by the front door (she also worked as a server, I later observed) that I was dining alone. This statement should be avoided in France unless you want the table by the kitchen door, hallway leading to the bathroom, or the front door, which is where she sat me. Between the tiny computer/desk/host setup with the computer and the front door was a miniscule table, where she sat me. I objected to being placed between the ad hoc work station and the patrons coming and going. She insisted no other table was available. I sat at the table for a few minutes trying to enjoy my Ernest Remy Blanc de Noir Grand Cru Champagne. It was impossible. I objected again only to be told it was not possible to move me. I began thinking about where else I could find a table at 8:30 on a Saturday night when a another server came to me and said he would move me as soon as a table opened up. I decided not to order any food until I was moved, which occurred about a half-hour later. Kitchen Ter(re) specializes in pasta, offering five main courses of it. Of the four appetizers, I was having a difficult time between two, so the same server who changed my table, offered to have a half-portion made of each. I appreciated his attitude. The delicious broth floated a half-moon-shaped grilled chicken ravioli clustered with enoki mushrooms, parsley, leek, red onion and vegetable slivers. On the adjacent plate were slices of raw fish placed on a bright yellow and intense citrus tasting sauce from the Asian calamensi fruit and curcuma(turmeric)spice. Both appetizers rivaled the excellence of my lunches at Ze Kitchen Galerie. My main course, blesotto (the grain ble), blended mushrooms, pesto, parsley and hazelnuts in a dish that resembled risotto with an intense mushroom and earthy flavor. If there was ever an ode to sorbet it was in the dessert glass that layered cappuccino, pineapple, passion fruit and coco-lime sorbets. I pushed my spoon through the four layers and gently extracted a sample of each sorbet. Much to my pleasure, the passion fruit was the “alpha” sorbet of the four. The others provided a pleasing diversion, and all formed a friendship with the Remy Champagne. As I enjoyed the combination, the fluent English-speaking server who salvaged my night asked me if there was anything else I needed. I told him he and the chef had already provided a perfect dinner. La Table d’Eugene (18th) 18 Rue Eugene Sue. This one-star Michelin restaurant is a cushioned 30-seat jewel box ideal for a quiet lunch or dinner. 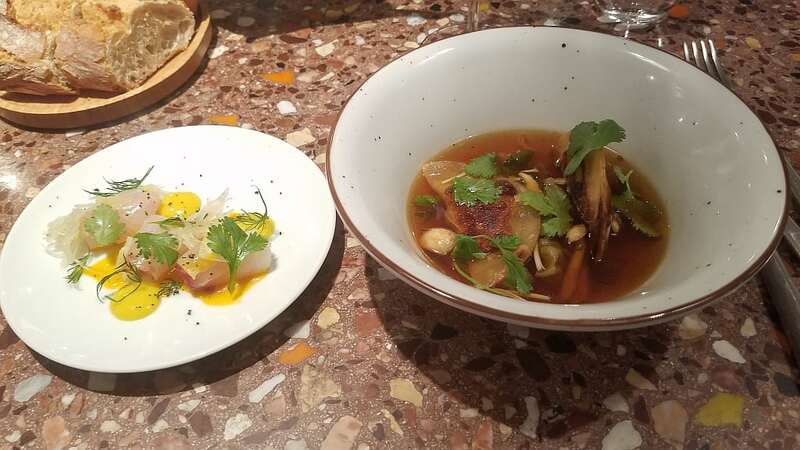 At my April 2018 Saturday lunch, there were two menus featuring two and three courses, at 35 and 42 euros respectively. 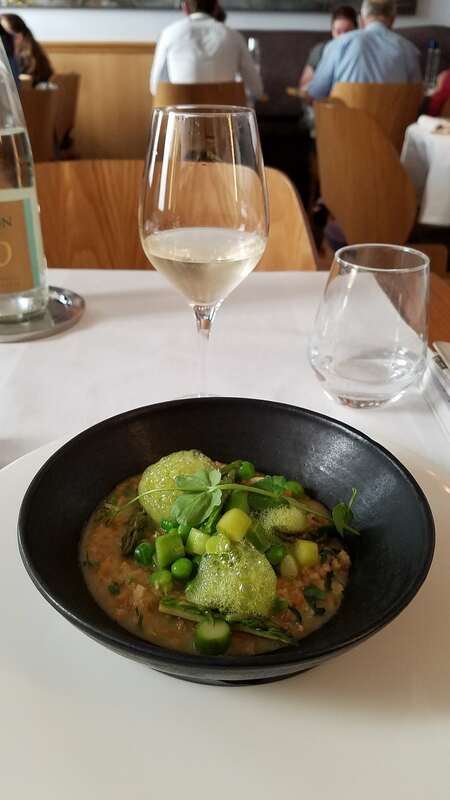 My two-course menu began with a perfect springtime barely risotto of asparagus and peas, which achieved the impossible: For the first time in my life I ate all the peas. 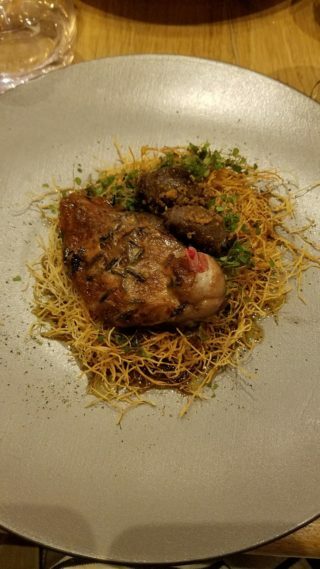 The chef’s extraordinary accomplishment was followed by rabbit loin served as three small towers wrapped in bacon sitting on alternating pea and hot mustard sauces. Surrounding them were sauteed wild mushrooms, broccolini, a lightly toasted grain, and wisps of frisse encircled by a rich, veal reduction. 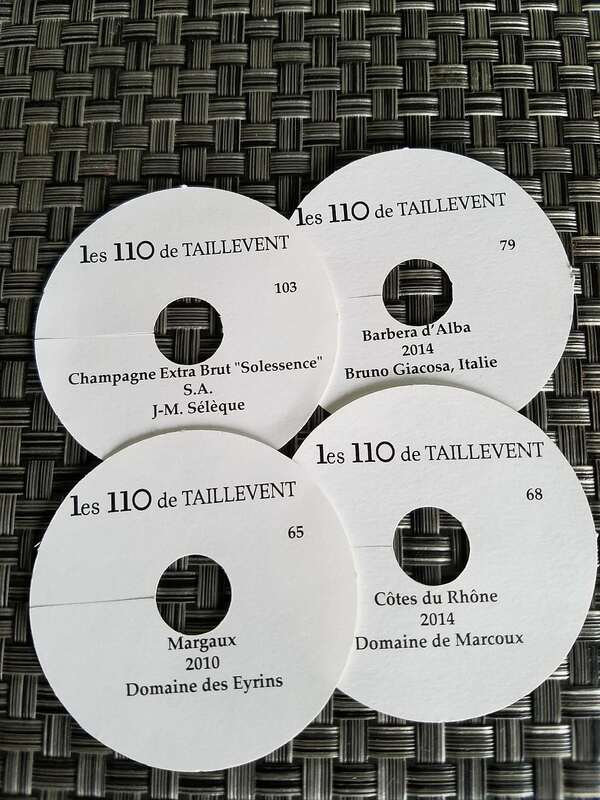 From the limited wine list, a heretofore unknown bottle of Jean Josseline Cuvee des Jean Champagne carried both dishes beyond their one-star ratings. La Table d’Eugene is a reminder that Paris is still a city offering intimate, civilized dining. Arnaud Nicolas (7th) 46 Avenue de la Bourdonnais. As you enter this restaurant, you see a chef making pates and terrines behind the glass partition. Most likely, it’s the reason you’re there. It was mine in April 2018. Chef Arnaud Nicolas built his career and his eponymous restaurant on the most silky, elegant, flavorful pates and terrines that I’ve ever tasted. And from my table, seeing others enjoy these signature plates, I guess they thought the same. You are poured a complimentary glass of sauvignon blanc when seated. I can’t recall that being done at any restaurant, but neither can I think of one where pates and terrines were the raison d’etre. Yet, the wine list is surprisingly short on red wines. Only three Bordeaux were listed, and they were from old and odd vintages. Burgundy had a much better representation. From the excellent 2015 vintage I chose Domaine Regis Bouvier, Marsannay, Clos du Roy vineyard. I discovered its medium-light body and spicy black-cherry, strawberry and raspberry flavors with mellow tannins partnered with the incredible pates needed. How could I not order the first pate of the nine listed when it is titled “Our Famous Poultry Pate in Pastry with Duck Foie Gras”? And how could I not write in my notebook “this is the finest chicken pate I have ever eaten,” after the velvet-textured, essence of chicken flavor and milk-chocolate-like duck liver taste were locked in my mouth? 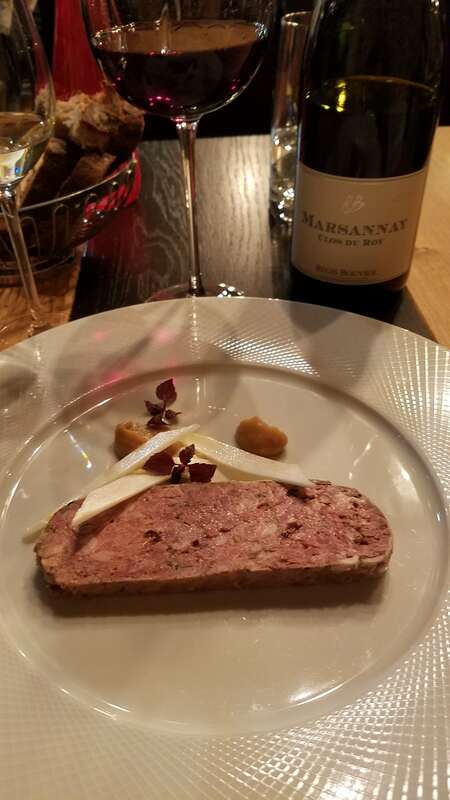 My second course was more difficult: Did I want the rabbit terrine with herbs more than the quail and foie gras pate in pastry with pear and pistachio? But what about the pork and foie gras pate in pastry with pistachio, or the terrine grand-mere: pork and poultry with pickled vegetables? I was bedeviled by my desires. My server stood there waiting. I looked up and committed to the grand-mere terrine. And, oh, what a pleasure it was! Pork liver and fat, pork and chicken meat, crushed black peppercorns saturated my palate. With each bite, I visualized the cholesterol flowing directly from my mouth to my veins, but what did I care? Death by ecstasy is the way to go. Then, the pleasure reached a higher level when I smeared the terrine on the dark-brown country bread patiently waiting in a basket beside my plate. I thought, why do I have to fly home tomorrow? Chef Arnaud Nicolas’ dinner special of tagliatelle with langoustines and a shellfish foam sauce showed he is much better with French animal parts than pasta. The langoustines and foam were delicious, but the pasta was dull. It was lifeless in the classic shellfish broth bound with butter. As I finished my Marsannay, I looked around the room at everyone eating pates and terrines. Two stylish French women beside me where enjoying their gorgeous duck foie gras terrine for two, proving that French women have good food sense as well as fashion sense. Restaurant Arnaud Nicolas will be my first lunch on my next trip to Paris. After you shake off your jet lag, make it yours, too. 110 Taillevent: (8th arr.) 195 Rue du Faubourg Saint-Honore’. It’s a good Sunday dinner choice as many highly regarded Paris restaurants are closed. The story is in the name: 110 wines by the glass in 14cl (4.7ounces) or 7cl (2.4ounces). 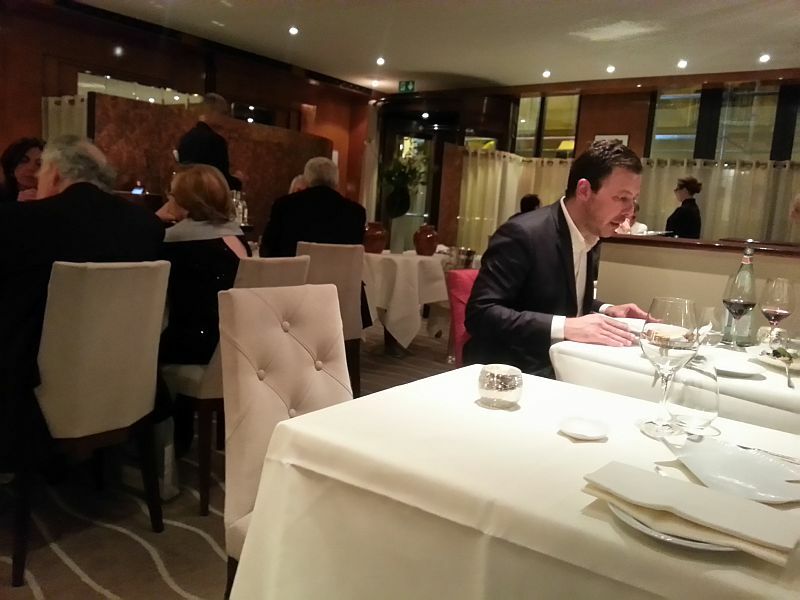 For many, Taillevent was once the greatest three-star Michelin restaurant in France (now two-star). 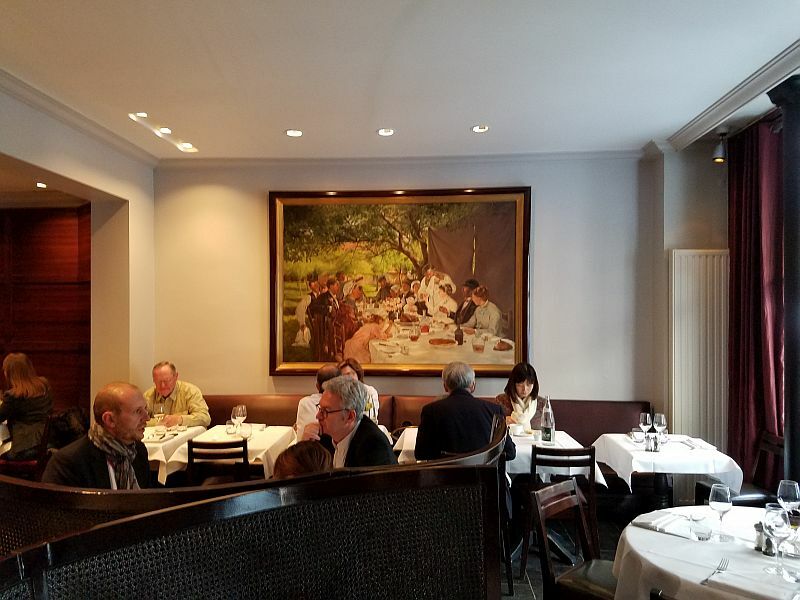 This sister restaurant is a lot less formal and less expensive; both restaurants are now owned by the family of Chateau Phelan-Segur, St. Estephe. April 2018 marked my latest return to this stylish restaurant for Sunday dinner. The larger pour (17 euros) of J.M. Seleque “Solessence” Brut Champagne with its full body, white-fruit taste and chalky mineral backbone was an excellent way to sip my way through the menu and the by-the-glass list of wines. My first course of Foie Gras & Oxtail terrine was served a little too cold, but leaving it for five minutes on the plate while tasting my two red wines—the 2014 Domaine de Marcoux, Cotes du Rhone, and 2010 Domaine des Eyrins, Margaux—brought out the oxtail’s richness. Fresh capers provided salinity and the discs of root vegetables donated color. 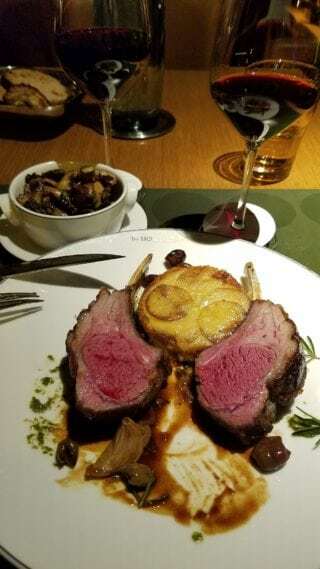 The perfectly cooked medium-rare rack of lamb was gamier than what I am usually served in France, but an order of sauteed mushrooms, including morels, captured my palate, as did the delicious potato tart. 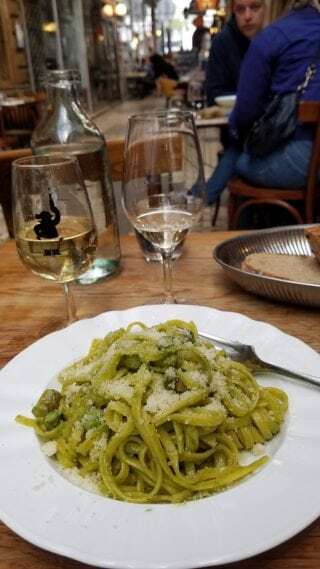 A glass of 2014 Bruno Giacosa Barbera d’Alba (15 euros) was exquisite with the dish. The sinfully rich chocolate cake provided decadence and the tangy passion fruit sorbet forgiveness, which shows that after a great dinner at 110 Taillevent, you can walk back to your hotel feeling virtuous. The French are sticklers for natural corks, but Chablis producer Michel Laroche uses only screws caps for his wines marketed to the American consumer, because time has shown it’s the best method for aging them. In 2005, Laroche presented seven Chablis wines from the excellent 2002 vintage to a group of wine writers, including me. The wines ranged from the basic Chablis appellation to Premier and Grand Crus, and each was bottled under two formats: natural cork and screw caps. Laroche wanted us to taste the wines blind so we were kept outside the room while the waiters poured the wines in two rows of seven glasses. After we took our seats, Laroche asked us to note on the tasting sheet which glasses we believed came from the natural cork wines, and which from the screw caps. All the wines were in very good condition, but the screw cap wines had fresher fruit aromas and flavors with crisper acidity. Of the seven wines, only the two glasses containing a Grand Cru Chablis left me wondering. 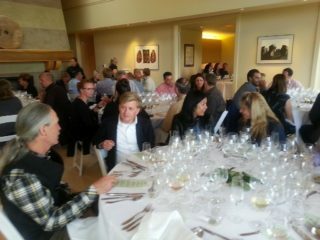 Laroche returned in 2007 for a tasting with the Wine Media Guild and four of the 2002 vintage Chablis. Each wine remained in good condition, and again the screw cap wines were fresher. At the conclusion of the tasting, we took two unopened bottles of each cork and screw cap wine to store for a future tasting and asked Laroche to return for it. Two weeks ago, Laroche joined us to retaste the same four wines, now nine years old. The additional four years of aging brought dramatic changes. The basic Chablis Saint Martin had gained complexity in its aroma and flavor in both bottles, but the screw cap wine retained a fresher acidity. The Premier Cru Les Vaudevey was pleasant from the cork closed bottle, but had a less vibrant finish when compared with the screw cap. The cork closed bottle was tired and not aging gracefully. The story was starkly different with both cork bottles of the Grand Cru Les Blanchots. The first bottle was corked, meaning the wine was tainted from an impure cork and had to be discarded. The second bottle was unbalanced, with the alcohol dominating the aroma and flavor, and the acidity very low. Owners of the cork-closed Les Blanchots would have incurred a loss of about $85 per bottle. Meanwhile, both screw cap closed bottles of Les Blanchots displayed complex aromas and flavors, full body, and a pleasant mineral finish. Both will have many more years of life. Both the cork and screw cap bottles of the Grand Cru Les Clos were in very good condition. But once again, the two bottles with screw caps possessed a fresher citrus and mineral character, an indication for a longer life. Even though Laroche knows wines age better with screw caps- all his wines marketed in America, Canada, and northern European countries are sold that way- tradition prevails in France, where only about 20 percent of Laroche Chablis are bottled with screw caps, and none at all in Spain, Italy or Portugal. “If my neighbor asked me for a wine that ages 10 years, I would tell him to buy one with a screw cap”, he says. Based on our tasting two weeks ago, you should encourage Laroche to become your neighbor. 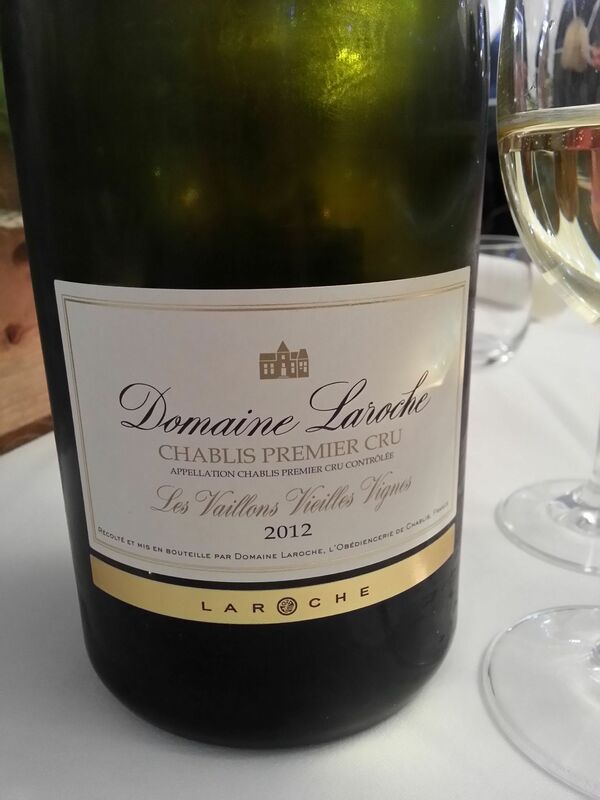 Domaine Laroche has deep roots in Chablis. 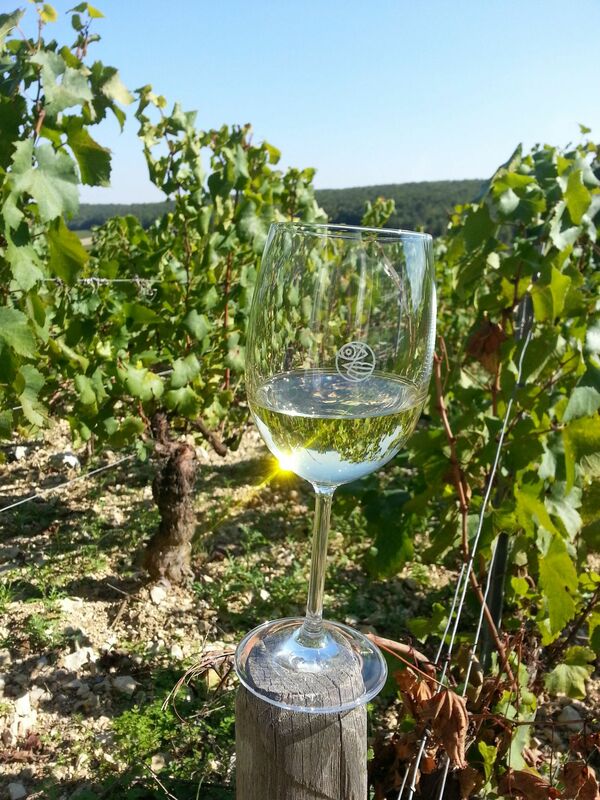 In 1850, Jean Victor Laroche purchase a parcel of land in Chablis and planted the family’s first chardonnay vines. For the next 117 years, the Laroche family produced wine from its 15 acre vineyard; then, fifth-generation, 21-year old Michel Laroche entered the business in 1967. In the following 11 years, Laroche hitched his vision to his youthful energy, expanding the family’s vineyards to 247 acres across the four Chablis classifications: petit chablis, chablis, premier and grand crus. And Laroche’s vision went far beyond the borders of Burgundy as he shocked this region- corseted by tradition- with its first screw cap closed wines in 2001. 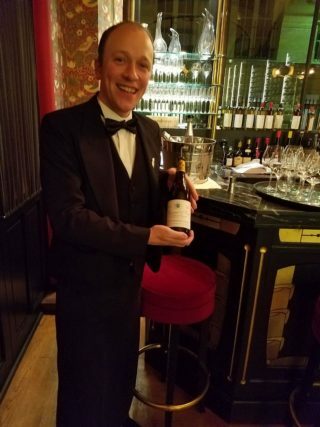 As though it were yesterday, I recall Laroche presenting his excellent 2002 premier and grand cru chablis in Manhattan for a comparative tasting of the same wines bottled under natural cork and screw cap. We were given two groups of seven wines; our task was to identify which had been sealed with natural cork and screw cap, respectively, and, which was premier or grand cru. 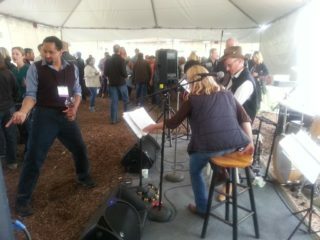 For some noted wine authorities, it was a humbling experience. For the record, I enjoyed the freshness of the screw cap closed wines, but a lifetime of drinking wines closed with natural cork determined my palate preference, and ultimately won my vote. 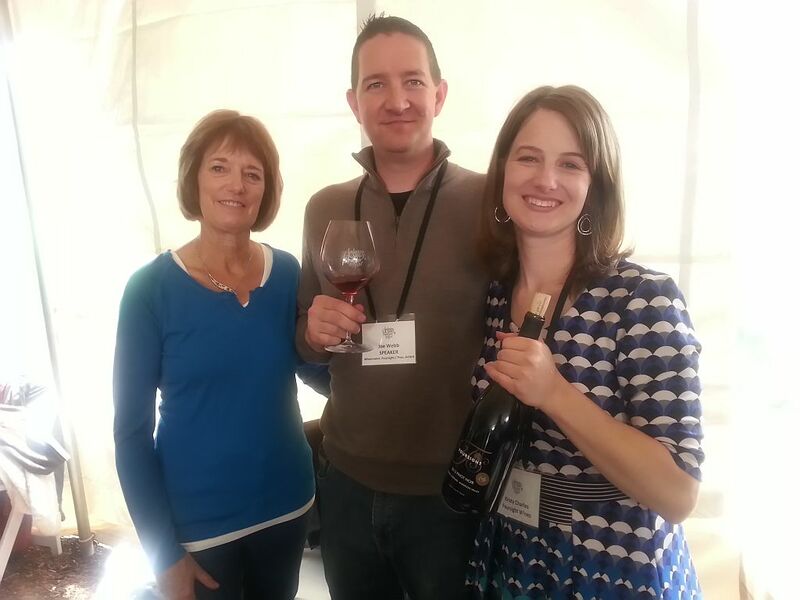 Last week, I returned to Domaine Laroche. The blue sky and full sunshine accompanied the brisk mornings and warm afternoons in this northern French vineyard area. Nearly this time last year, I had dinner with Viennois at The Modern restaurant in Manhattan. Viennois poured the 2012 Domaine Laroche Les Vaillons Premier Cru Vieilles Vignes Chablis with The Modern’s sweet potato gnocchi; last week, Viennois presented the wine with a large shrimp encrusted in angel hair like potato shavings. Both presentations allowed the pear and apple flavors to shine brightly, and the mineral backbone and acidity balanced the 2012 Vaillons’ pungent fruit. The added year of bottle age removed the touch of alcohol that I noted in last year’s tasting. 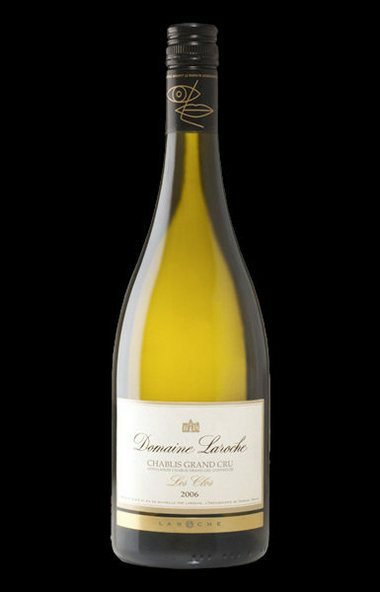 Domaine Laroche’s premier and grand cru chablis benefit from cellar aging, and excellent vintages like 2012 will gain complexity for decades. When mature, these full-body wines are perfect partners with veal, pork and poultry dishes. But, for immediate pleasure, turn to the Domaine Laroche Saint Martin Chablis. The 153 acre Saint Martin vineyard is composed of Chablis’ Kimmeridgian soil: a mix of limestone, clay and fossilized oyster shells. Fermented and aged in stainless-steel tanks, and void of malolactic fermentation, the 2013 Domaine Laroche Saint Martin poured at The Modern, and the 2014 version presented last week at Domaine Laroche, were fruit-forward, crisp, delightful wines. Enjoy either vintage with fresh or fried oysters —the chef’s choice at The Modern– Japanese seafood rolls and Cantonese cuisine. The 2012 Les Vaillons Premier Cru Vieilles Vignes retails for about $55; the 2013 and 2014 Saint Martin is about $27.